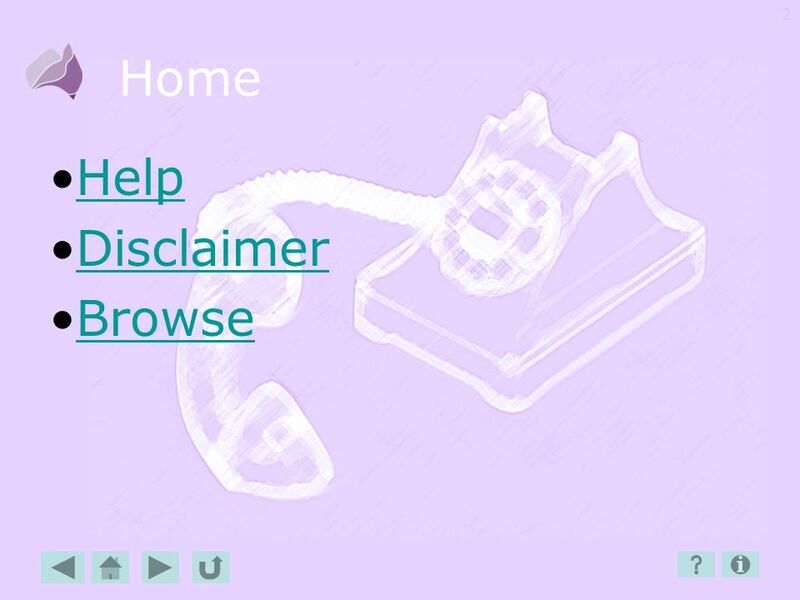 3 Disclaimer Welcome to Phone-glish, a PowerPoint tool to help you make sense of phone jargon. 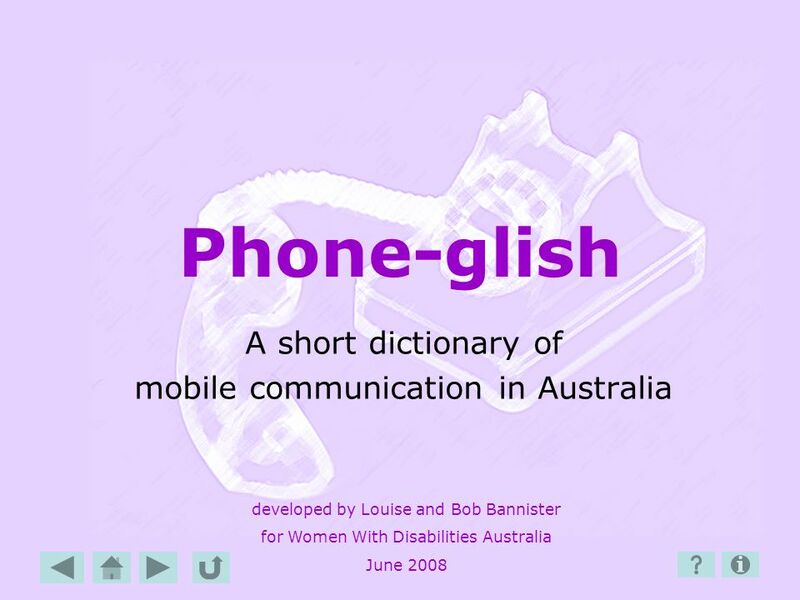 It is a simple glossary of telecommunications terms in alphabetical order. Unfortunately it won’t solve all your phone confusion - it only gives brief explanations. So WWDA accepts no responsibility for any action taken on reliance of Phone-glish contents. 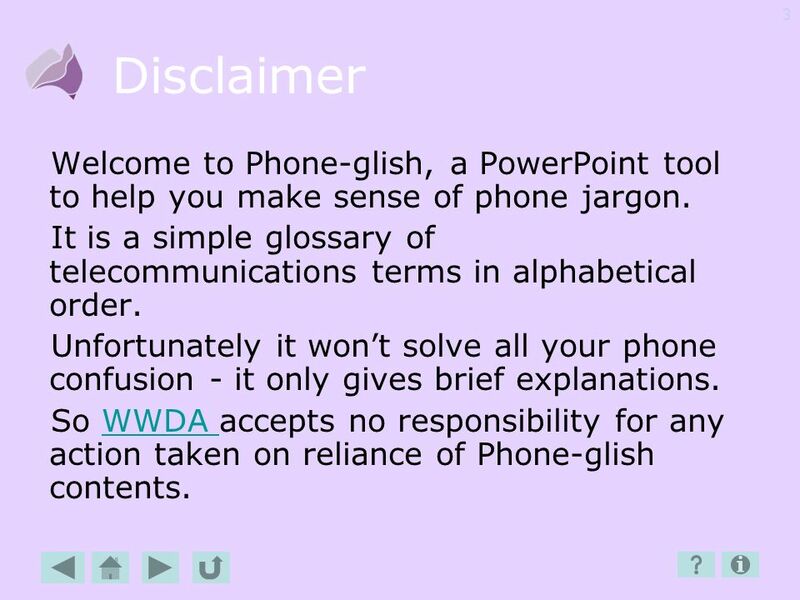 Phone-glish is brought to you by WWDA. It is for information only, and WWDA takes no responsibilitby for your phone purchase decisions. 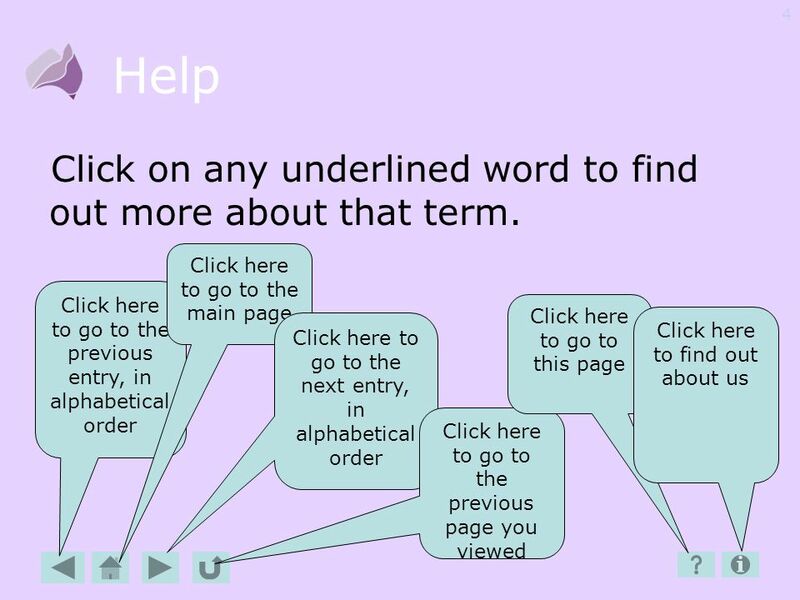 4 Help Click on any underlined word to find out more about that term. 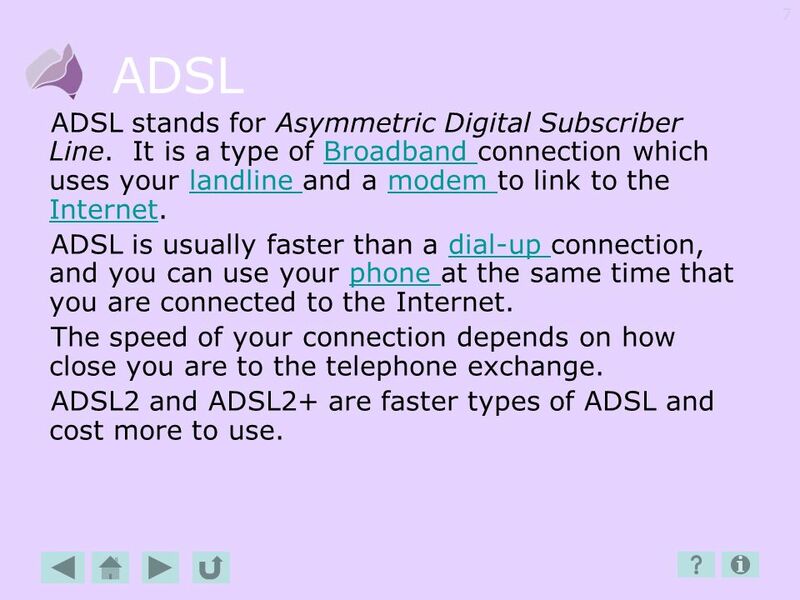 7 ADSL ADSL stands for Asymmetric Digital Subscriber Line. 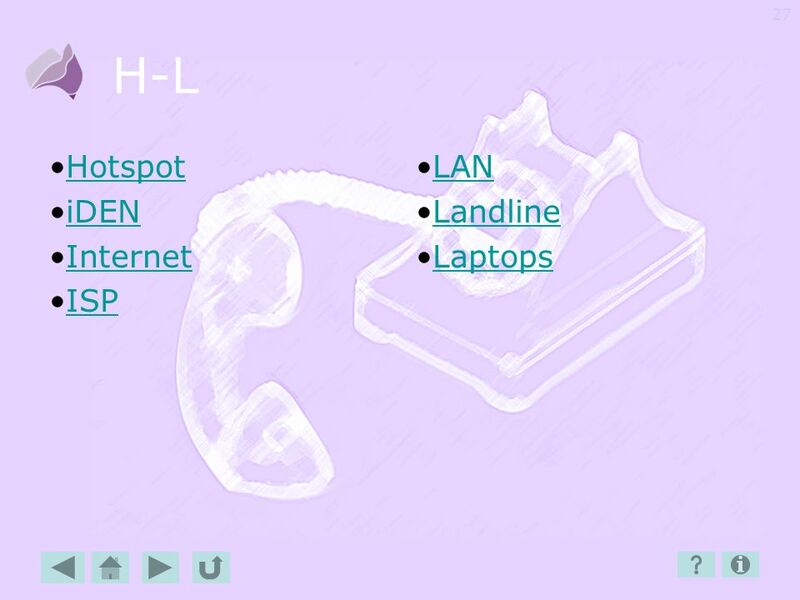 It is a type of Broadband connection which uses your landline and a modem to link to the Internet. 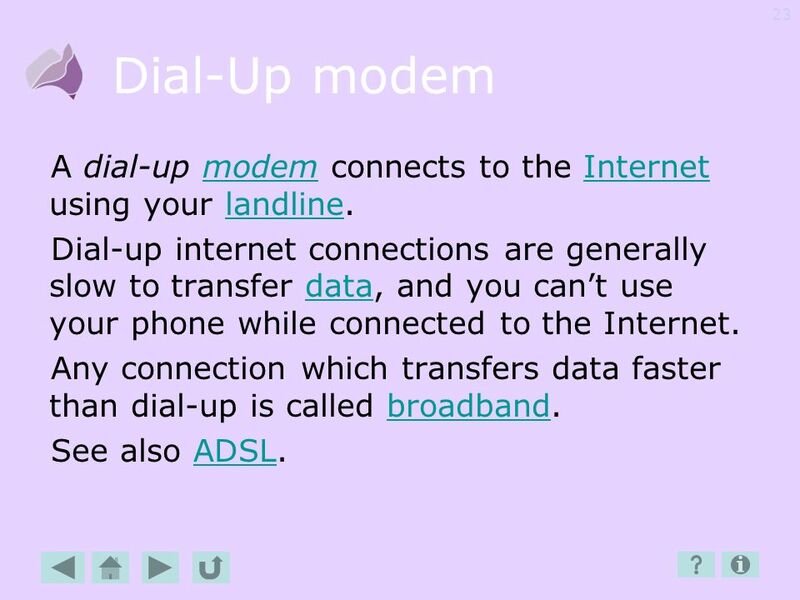 ADSL is usually faster than a dial-up connection, and you can use your phone at the same time that you are connected to the Internet. The speed of your connection depends on how close you are to the telephone exchange. ADSL2 and ADSL2+ are faster types of ADSL and cost more to use. 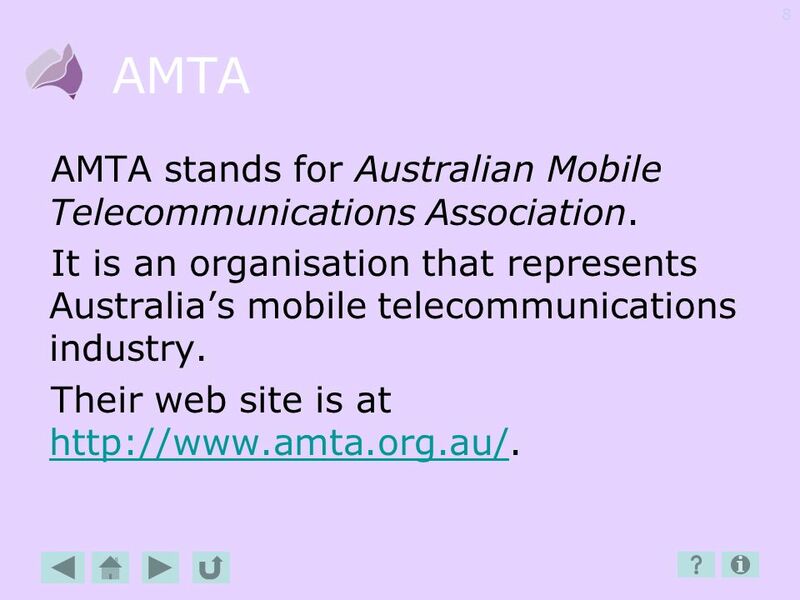 8 AMTA AMTA stands for Australian Mobile Telecommunications Association. 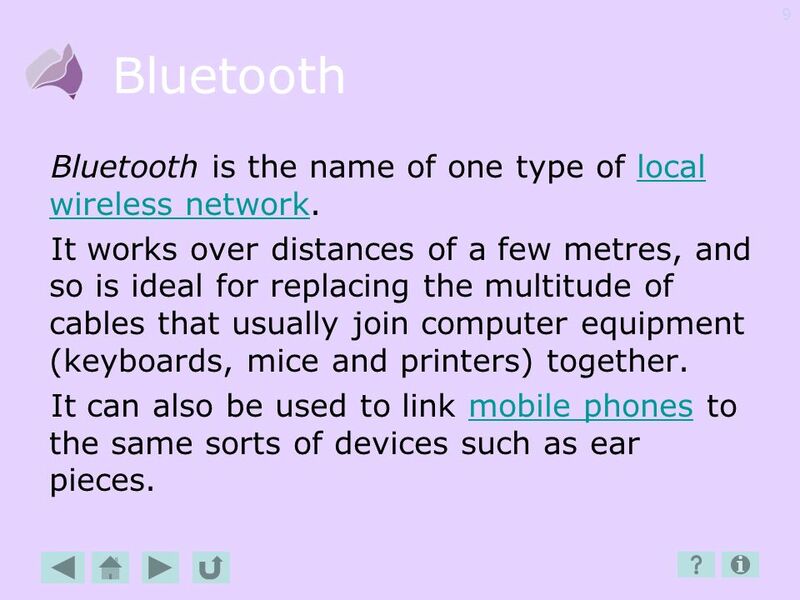 9 Bluetooth Bluetooth is the name of one type of local wireless network. It works over distances of a few metres, and so is ideal for replacing the multitude of cables that usually join computer equipment (keyboards, mice and printers) together. 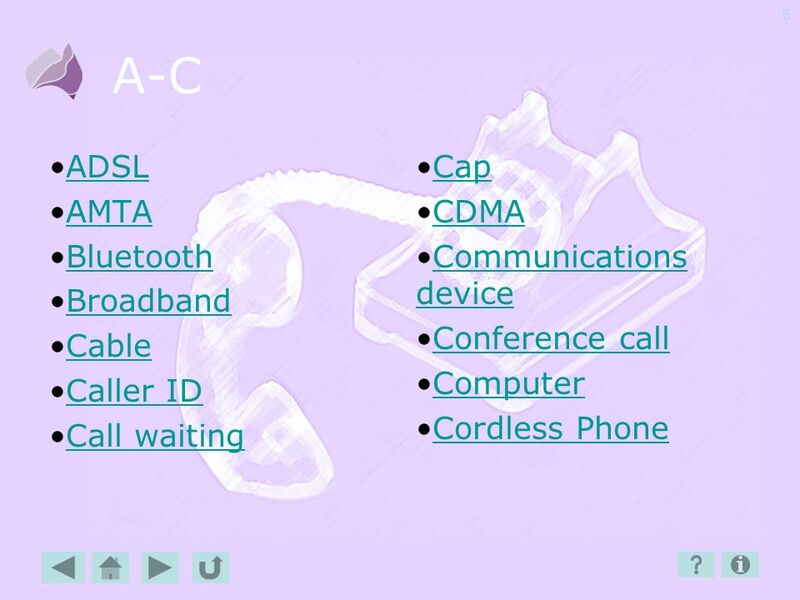 It can also be used to link mobile phones to the same sorts of devices such as ear pieces. 10 Broadband Broadband is a high-speed way of transmitting data. Any data transmission faster than dial-up speeds is considered to be broadband. 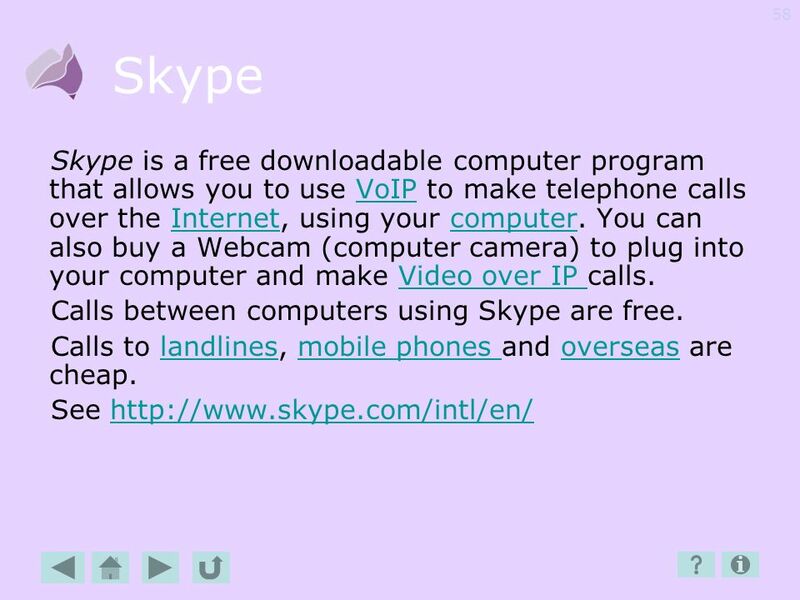 It can be used for Internet, but also for video and phone connections. 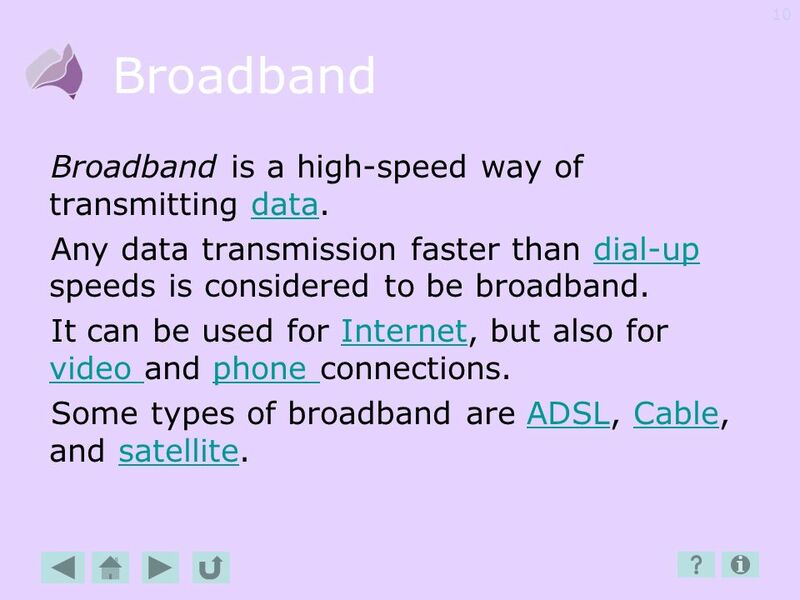 Some types of broadband are ADSL, Cable, and satellite. 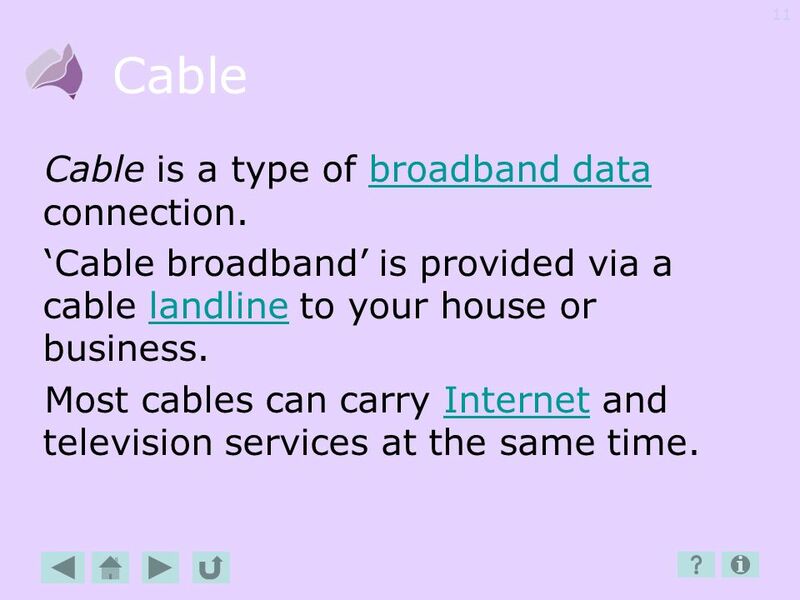 11 Cable Cable is a type of broadband data connection. ‘Cable broadband’ is provided via a cable landline to your house or business. Most cables can carry Internet and television services at the same time. 12 Caller ID Caller ID shows you the incoming number of the person who is phoning you. 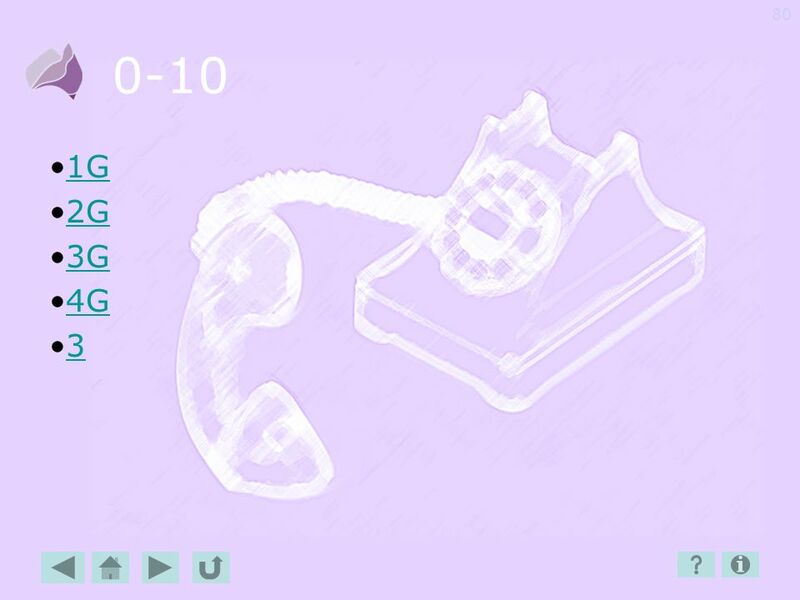 You can use this to decide whether to answer a call or not. That phone number is stored on a mobile phone’s ‘call history’ so you can phone back. 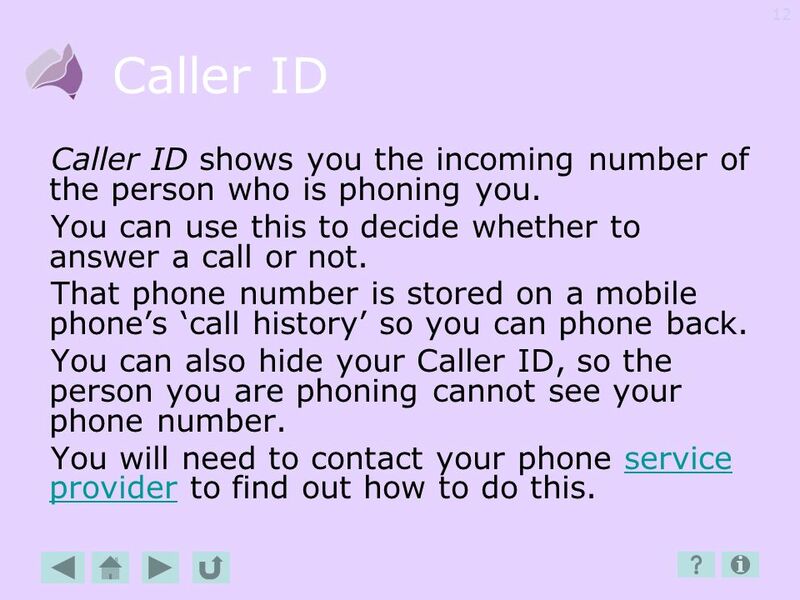 You can also hide your Caller ID, so the person you are phoning cannot see your phone number. You will need to contact your phone service provider to find out how to do this. 13 Call Waiting Call Waiting is the beeping sound you hear when you are already on the phone and a second person calls. Depending on which phone service you have, you can choose to switch over to the second call, or call back when you are finished. Contact your service provider to find out how to switch on, or switch off, ‘Call Waiting’. 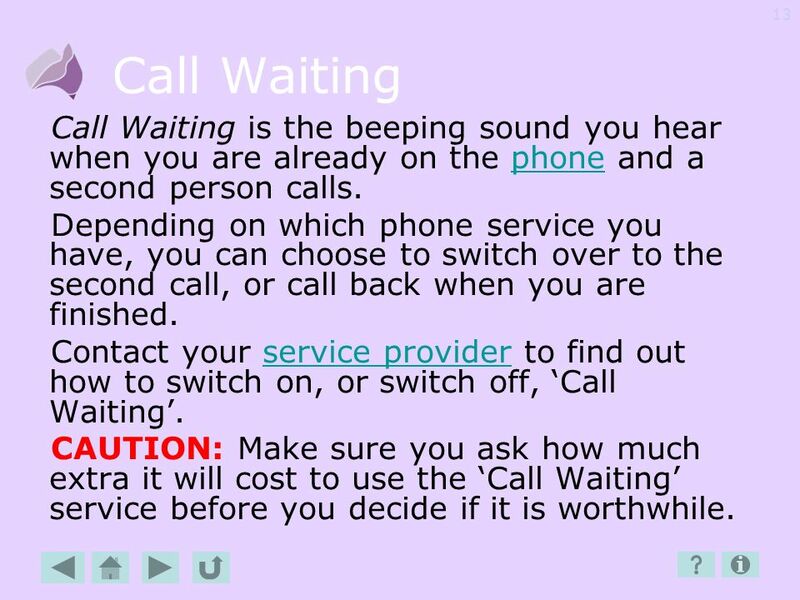 CAUTION: Make sure you ask how much extra it will cost to use the ‘Call Waiting’ service before you decide if it is worthwhile. 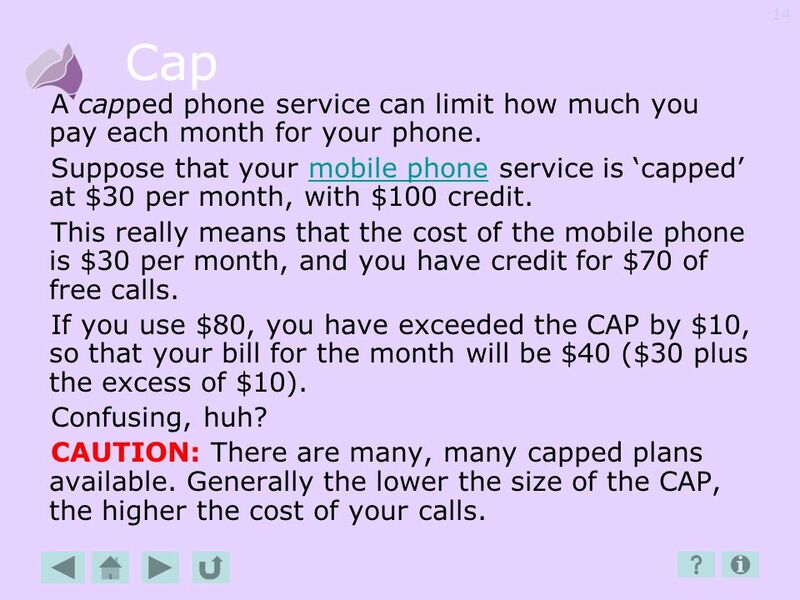 14 Cap A capped phone service can limit how much you pay each month for your phone. Suppose that your mobile phone service is ‘capped’ at $30 per month, with $100 credit. This really means that the cost of the mobile phone is $30 per month, and you have credit for $70 of free calls. If you use $80, you have exceeded the CAP by $10, so that your bill for the month will be $40 ($30 plus the excess of $10). Confusing, huh? CAUTION: There are many, many capped plans available. Generally the lower the size of the CAP, the higher the cost of your calls. 15 CDMA CDMA stands for Code Division Multiple Access. It is a way for mobile devices to talk to each other. 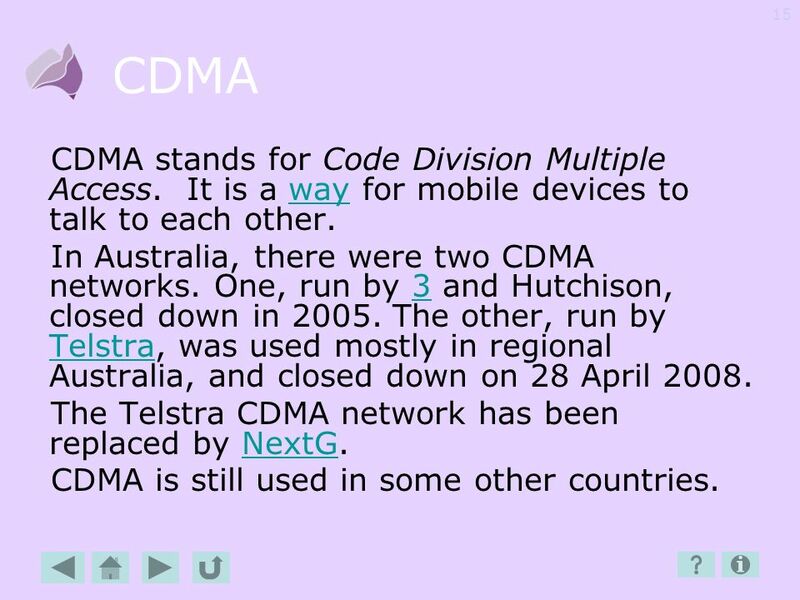 In Australia, there were two CDMA networks. One, run by 3 and Hutchison, closed down in The other, run by Telstra, was used mostly in regional Australia, and closed down on 28 April 2008. 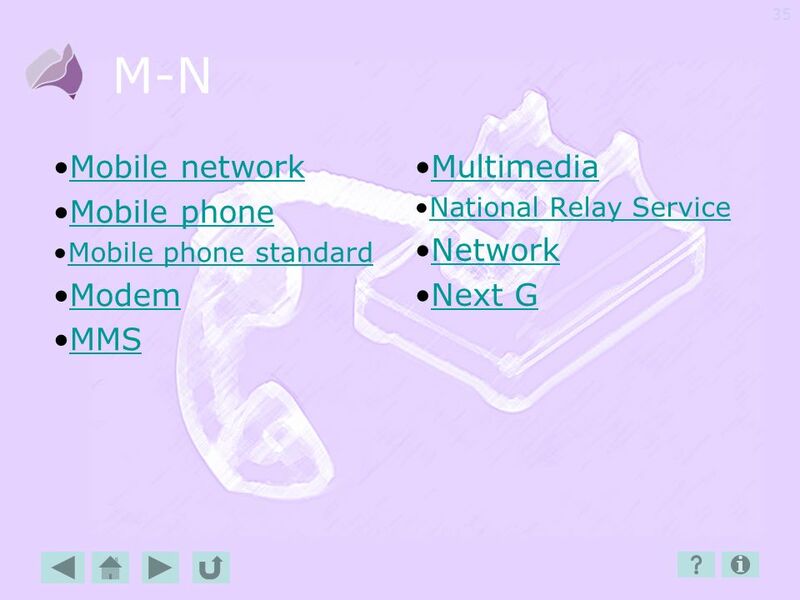 The Telstra CDMA network has been replaced by NextG. CDMA is still used in some other countries. 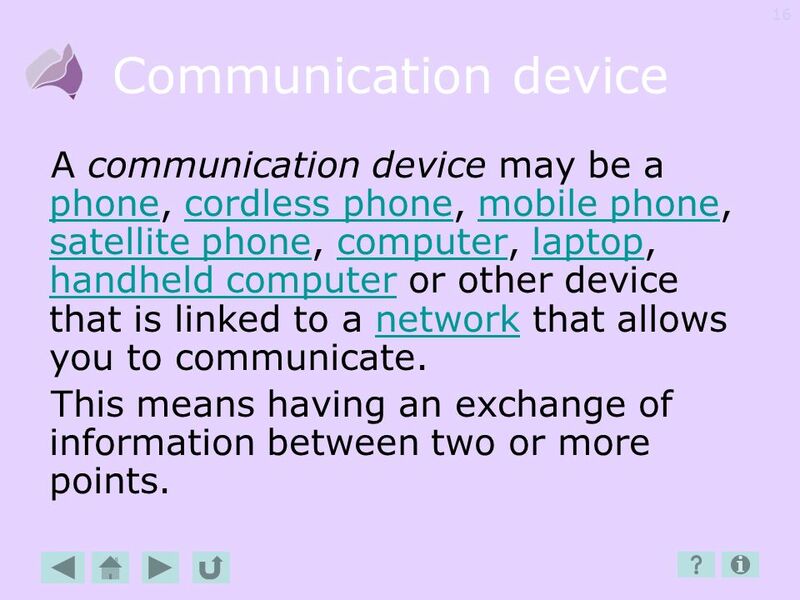 16 Communication device A communication device may be a phone, cordless phone, mobile phone, satellite phone, computer, laptop, handheld computer or other device that is linked to a network that allows you to communicate. This means having an exchange of information between two or more points. 17 Computer A computer is a device which processes many sorts of data. At first they were gigantic in size and filled whole rooms. Then we learned to make them smaller and smaller, so they could fit into our offices, and then into our lounge rooms and bedrooms. Now they are so small they fit on our laps and in our pockets. They help run our phones, cars, banks and supermarkets. In fact these days they are pretty well unavoidable. I think that anthropomorphism might be too hard for people with cognitive impairment. 18 Conference Call A conference call allows people with different phone numbers at different locations to talk together during the same phone call, instead of having a conversation with just one person. You might use them for important family meetings, to have a committee meeting for your club, or talk with staff at a remote office. Your Service Provider can tell you how to organise a Conference Call. You may have to start an account with a Conference Call company such as ‘Genesys’, ‘MyConference’ and ‘Quorum’. CAUTION: Conference Calls can be very expensive. 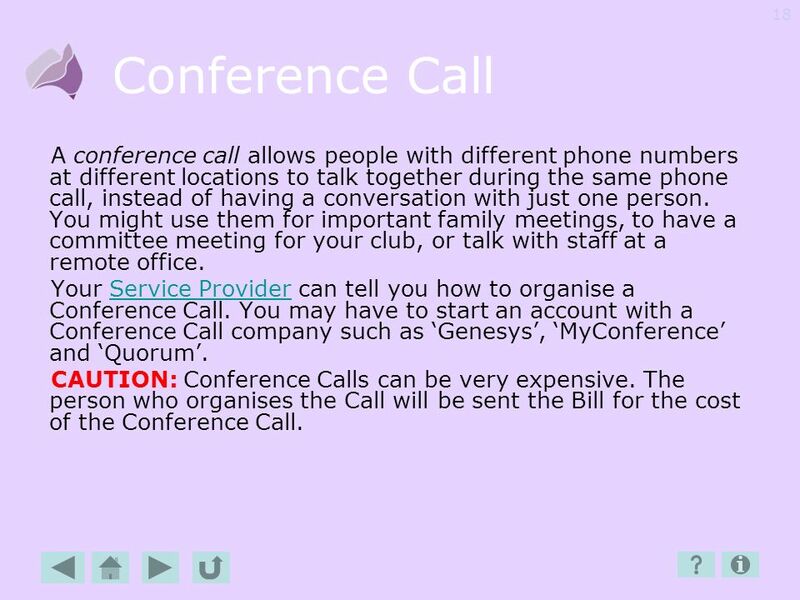 The person who organises the Call will be sent the Bill for the cost of the Conference Call. 19 Cordless Phone A cordless phone allows you to use your phone while you move around your home or business. It has two parts, a base station and a handset. The base station stays plugged into both the landline (via the phone attachment on the wall) and to the electricity supply. 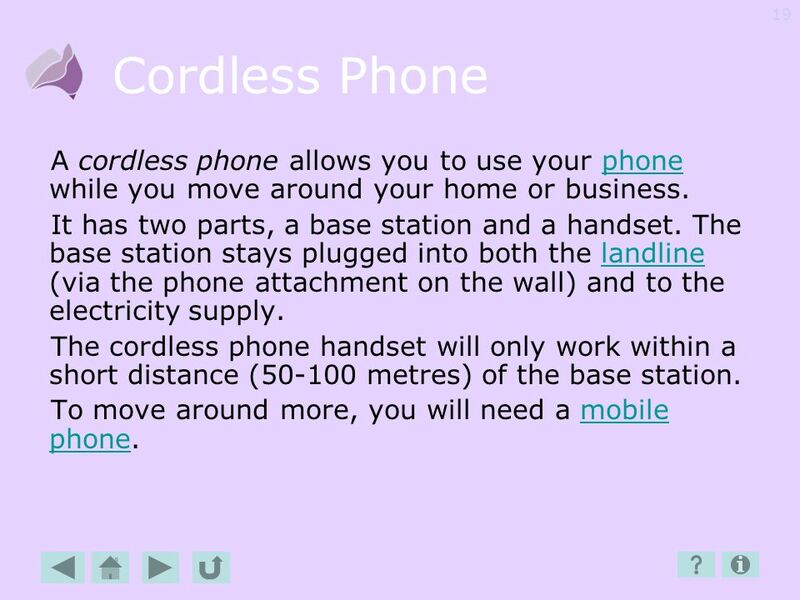 The cordless phone handset will only work within a short distance ( metres) of the base station. To move around more, you will need a mobile phone. 21 Data Data is any information that can be sent from one communications device to another. 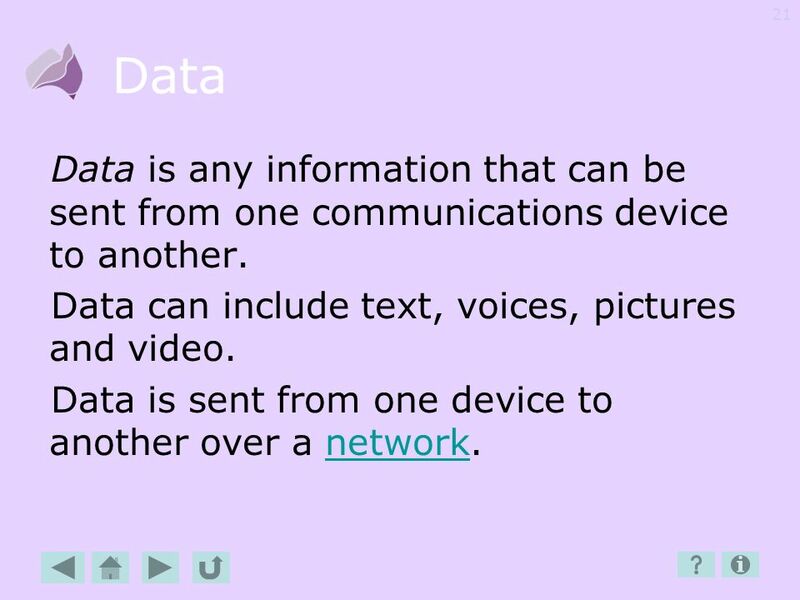 Data can include text, voices, pictures and video. Data is sent from one device to another over a network. 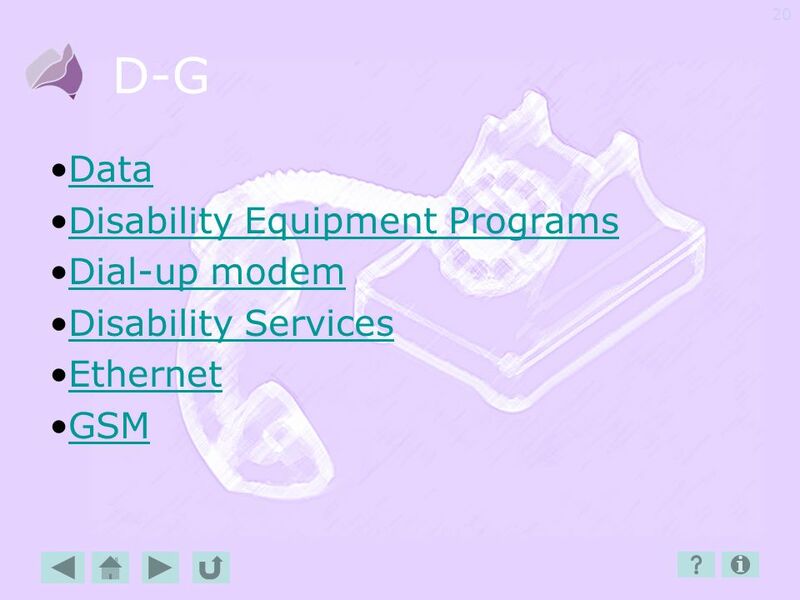 22 DEP Disability Equipment Programs (DEP) are programs available to provide specialised telecommunications equipment to people with special needs so they can access a standard phone service. 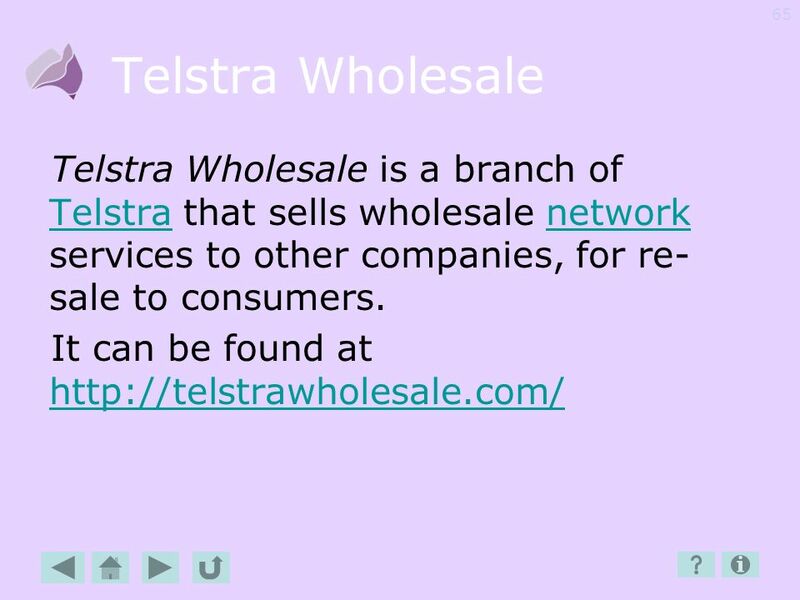 Telstra’s DEP is considered to be the main program. 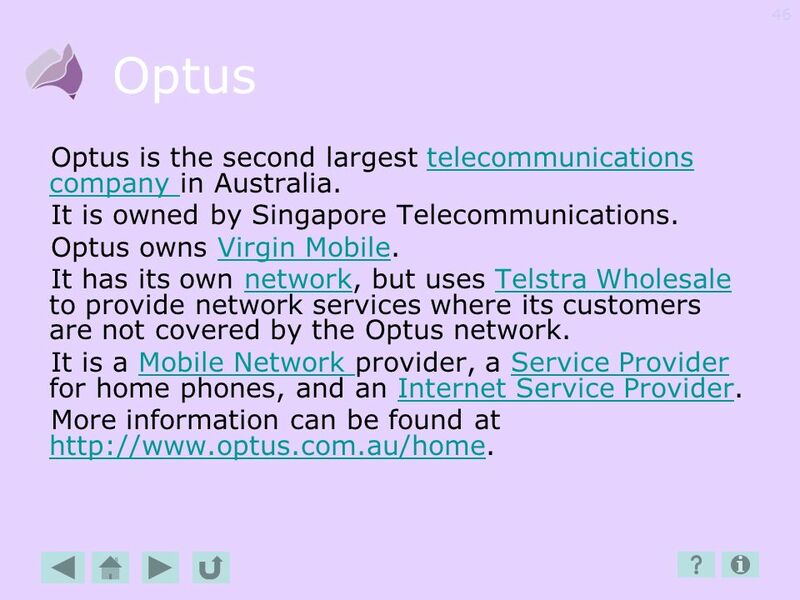 Optus’ DEP is a smaller program. 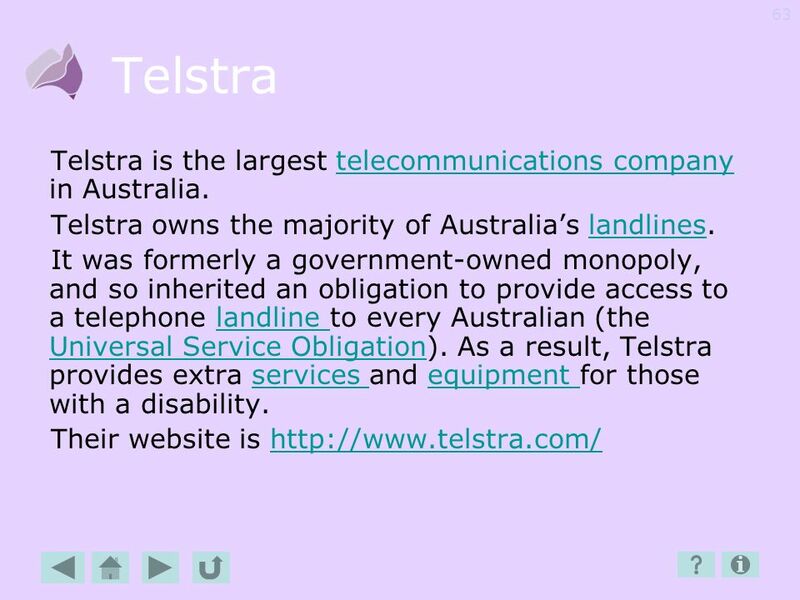 If you are not a Telstra customer, your Service Provider should be able to rent equipment from the Telstra DEP on your behalf. Make enquiries about it. There are other disability services available. 23 Dial-Up modem A dial-up modem connects to the Internet using your landline. Dial-up internet connections are generally slow to transfer data, and you can’t use your phone while connected to the Internet. Any connection which transfers data faster than dial-up is called broadband. See also ADSL. 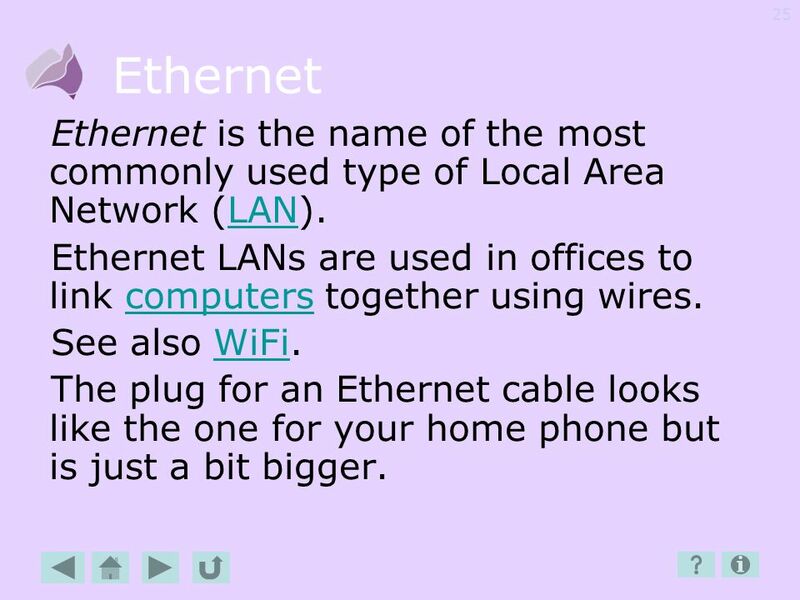 25 Ethernet Ethernet is the name of the most commonly used type of Local Area Network (LAN). Ethernet LANs are used in offices to link computers together using wires. See also WiFi. The plug for an Ethernet cable looks like the one for your home phone but is just a bit bigger. 26 GSM GSM stands for Global System for Mobile Communications. 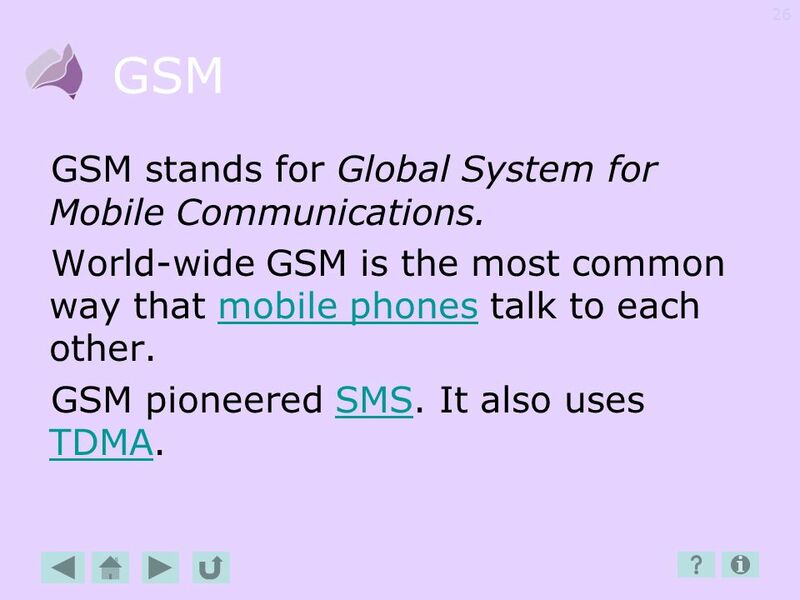 World-wide GSM is the most common way that mobile phones talk to each other. GSM pioneered SMS. It also uses TDMA. 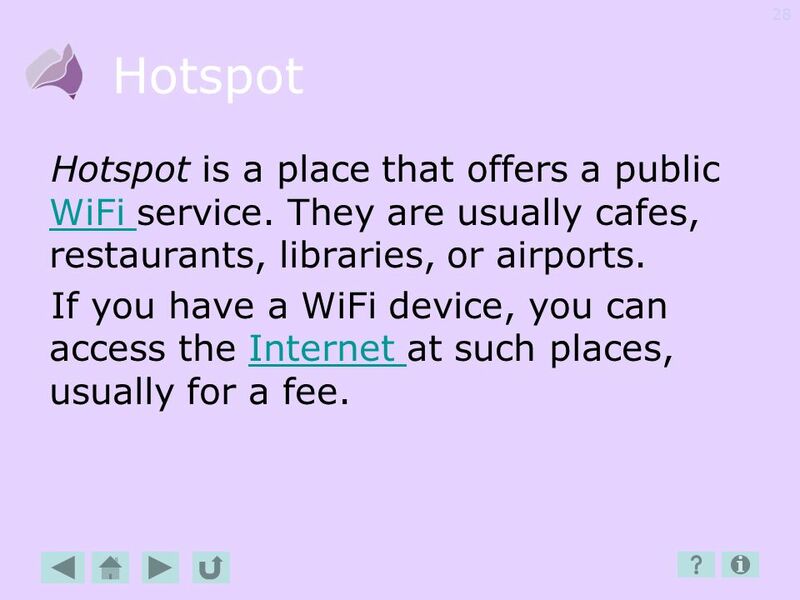 28 Hotspot Hotspot is a place that offers a public WiFi service. They are usually cafes, restaurants, libraries, or airports. If you have a WiFi device, you can access the Internet at such places, usually for a fee. 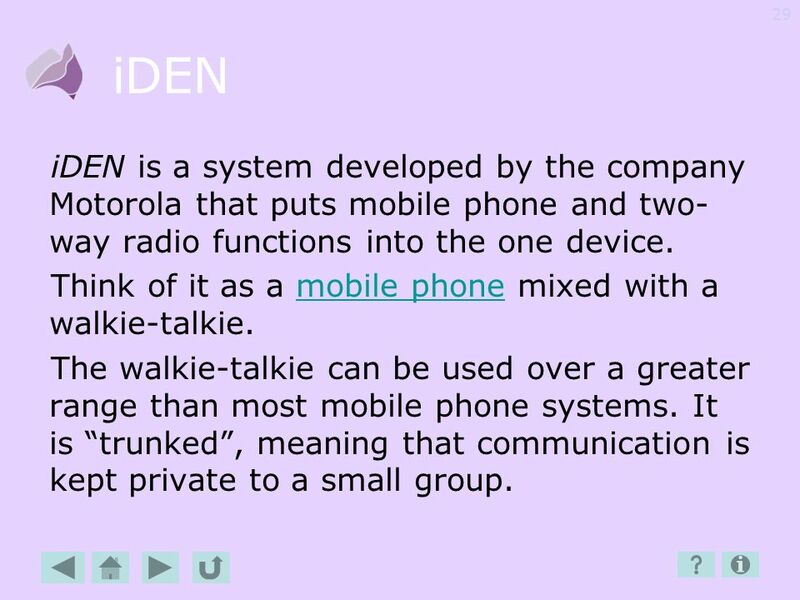 29 iDEN iDEN is a system developed by the company Motorola that puts mobile phone and two-way radio functions into the one device. Think of it as a mobile phone mixed with a walkie-talkie. The walkie-talkie can be used over a greater range than most mobile phone systems. It is “trunked”, meaning that communication is kept private to a small group. 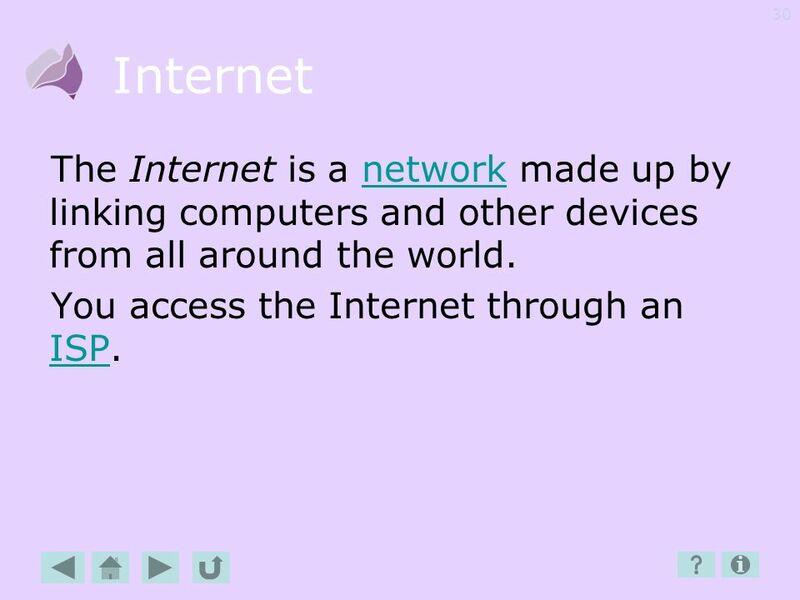 30 Internet The Internet is a network made up by linking computers and other devices from all around the world. You access the Internet through an ISP. 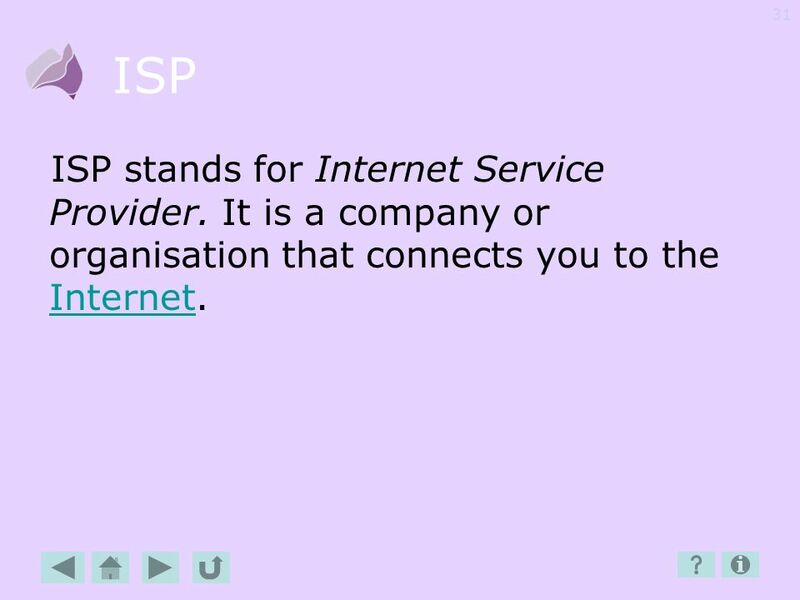 31 ISP ISP stands for Internet Service Provider. It is a company or organisation that connects you to the Internet. 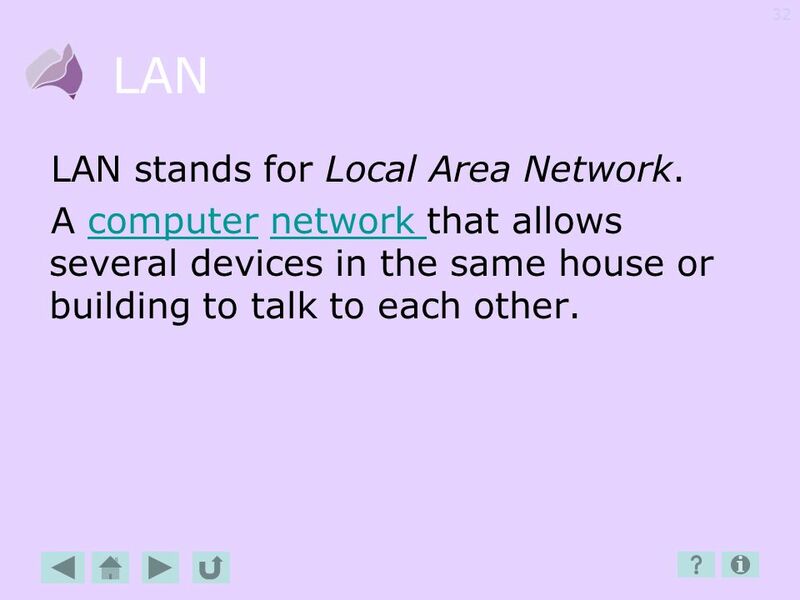 32 LAN LAN stands for Local Area Network. 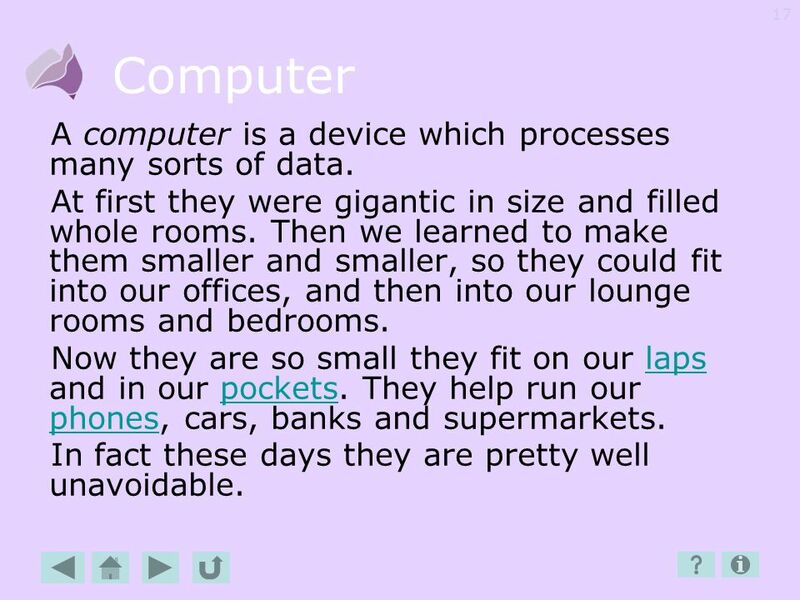 A computer network that allows several devices in the same house or building to talk to each other. 34 Laptops A laptop is a small computer, but one not small enough to fit in your pocket. 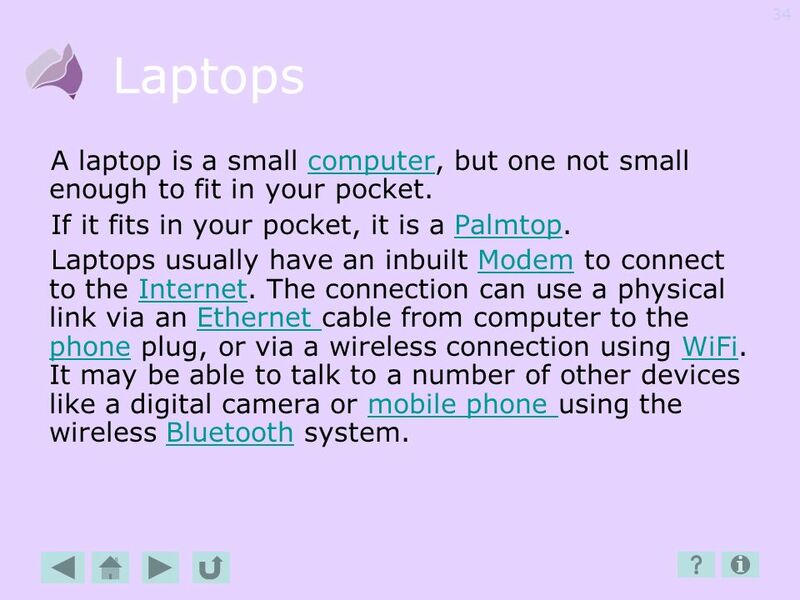 If it fits in your pocket, it is a Palmtop. Laptops usually have an inbuilt Modem to connect to the Internet. 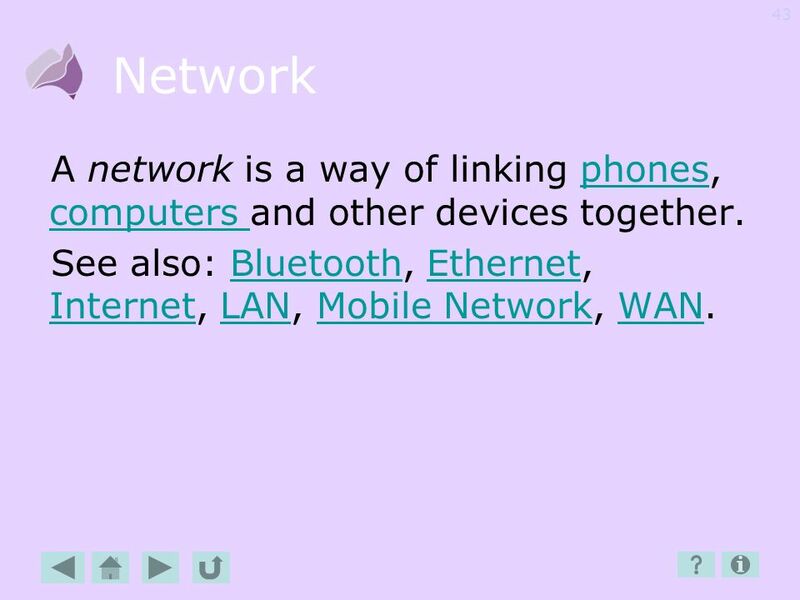 The connection can use a physical link via an Ethernet cable from computer to the phone plug, or via a wireless connection using WiFi. It may be able to talk to a number of other devices like a digital camera or mobile phone using the wireless Bluetooth system. 36 Mobile network Mobile Networks connect your mobile phone or computer to other phones or the Internet. They are run by a Service Provider. 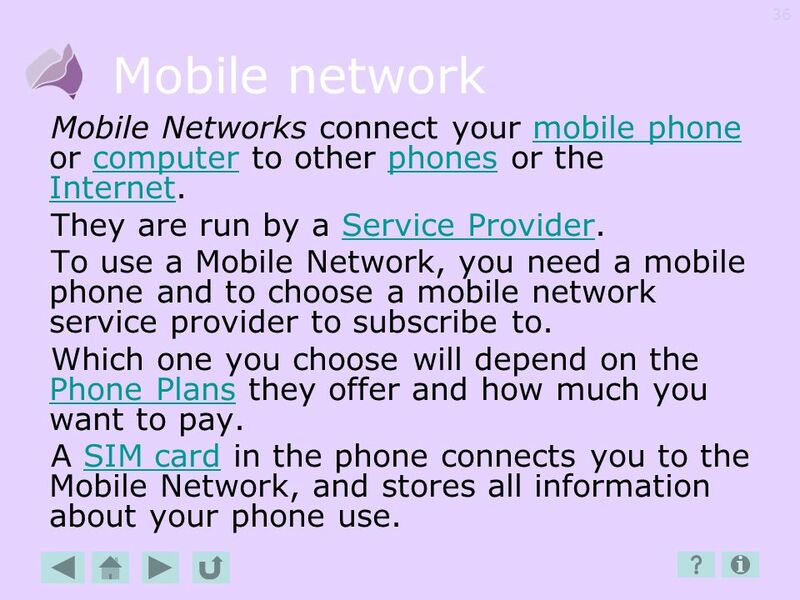 To use a Mobile Network, you need a mobile phone and to choose a mobile network service provider to subscribe to. Which one you choose will depend on the Phone Plans they offer and how much you want to pay. 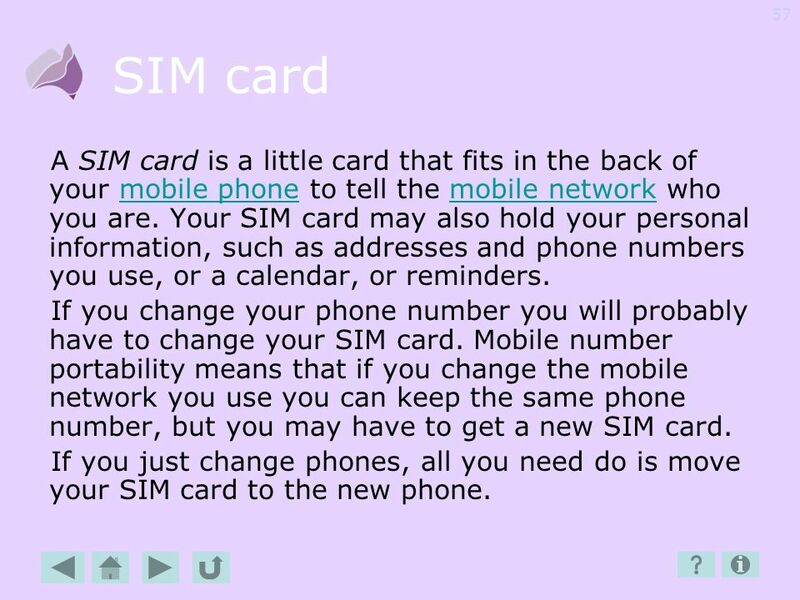 A SIM card in the phone connects you to the Mobile Network, and stores all information about your phone use. 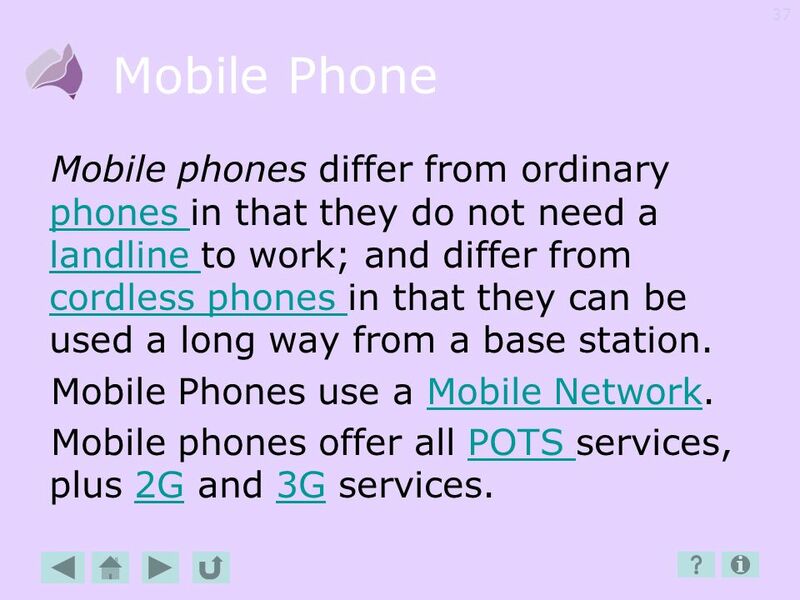 37 Mobile Phone Mobile phones differ from ordinary phones in that they do not need a landline to work; and differ from cordless phones in that they can be used a long way from a base station. Mobile Phones use a Mobile Network. 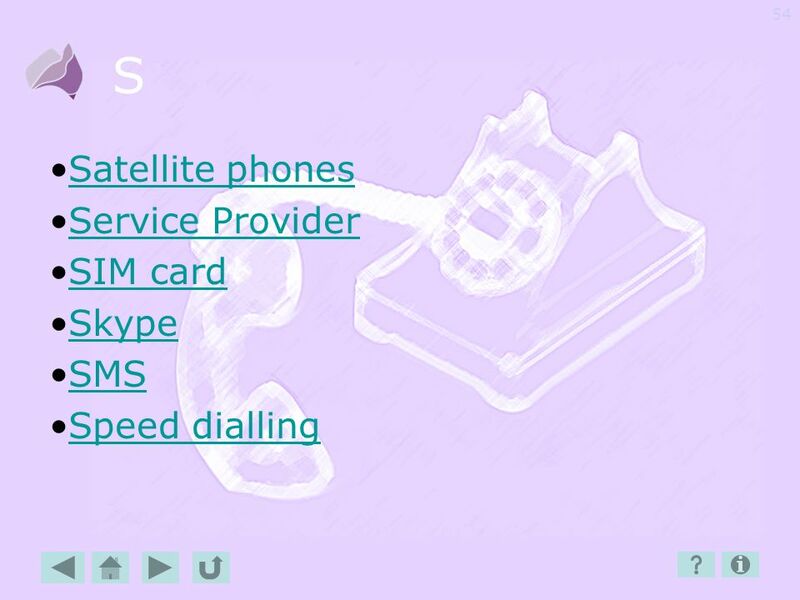 Mobile phones offer all POTS services, plus 2G and 3G services. 39 Modem A modem is usually a box that plugs in between your computer and your landline. It also plugs into the power point. A modem allows you to send and receive data. 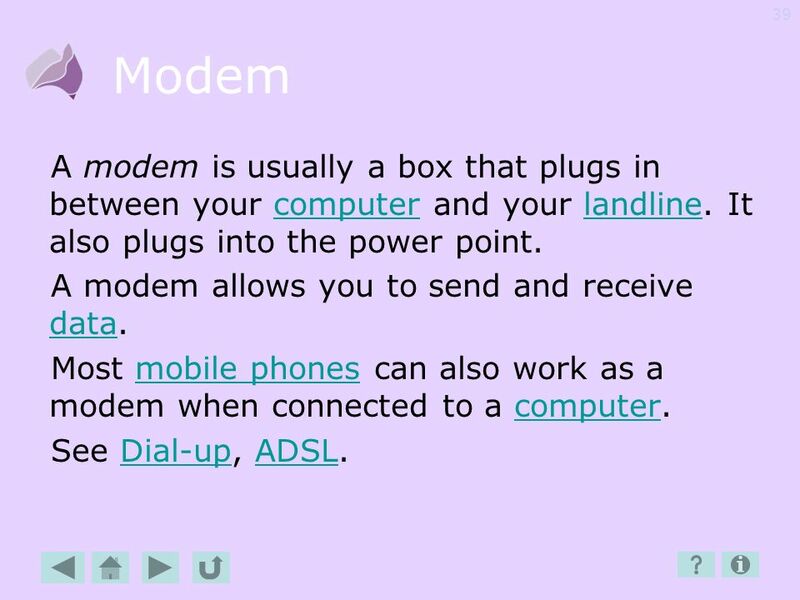 Most mobile phones can also work as a modem when connected to a computer. See Dial-up, ADSL. 40 MMS MMS stands for Multimedia Messaging Service. It is sending pictures, spoken messages or short videos via a phone. 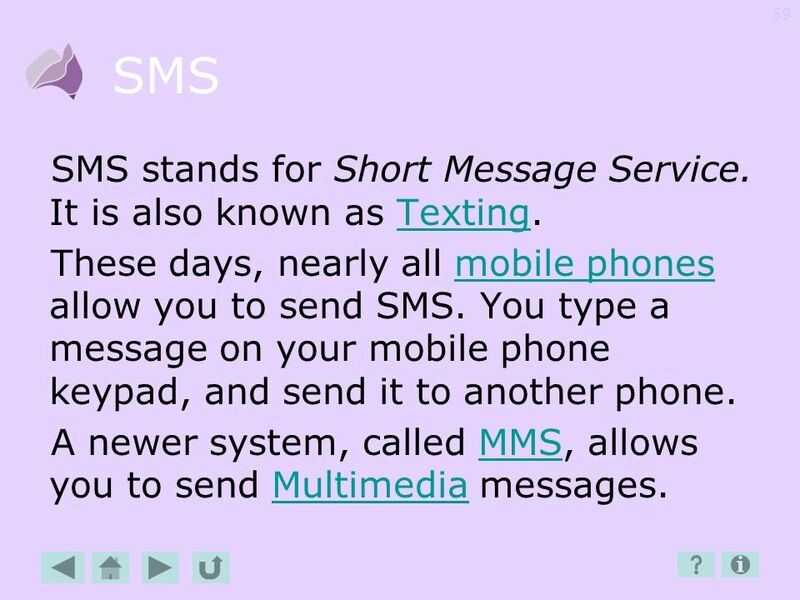 MMS is different from SMS, which can only be used for text. 41 Multimedia Multimedia is messages and documents that have more than just writing and text. 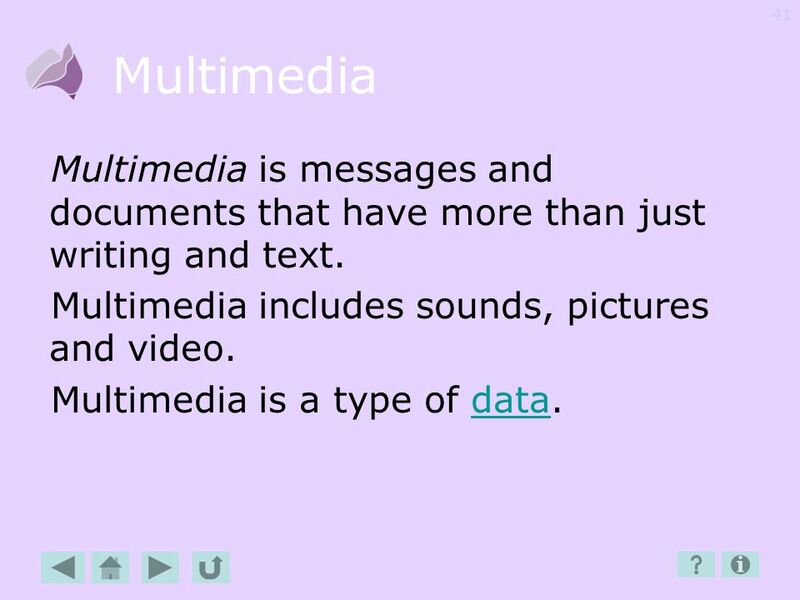 Multimedia includes sounds, pictures and video. Multimedia is a type of data. 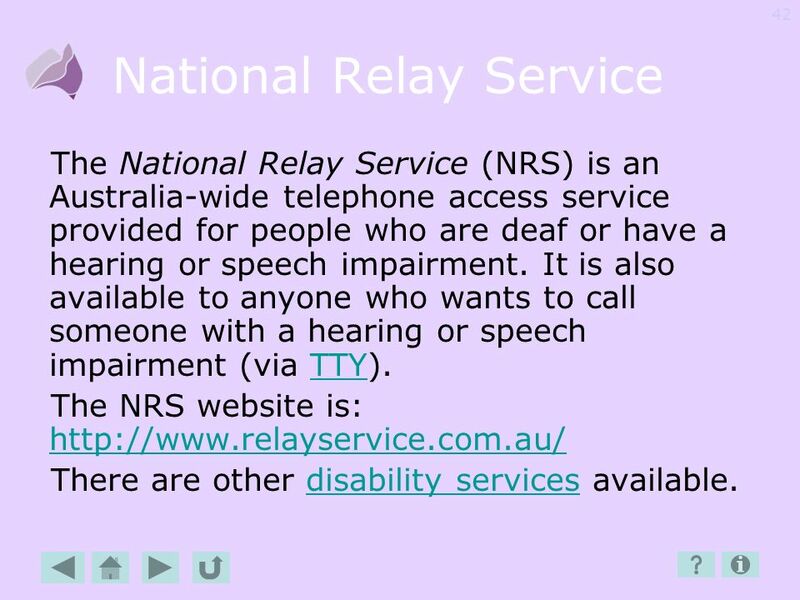 The National Relay Service (NRS) is an Australia-wide telephone access service provided for people who are deaf or have a hearing or speech impairment. 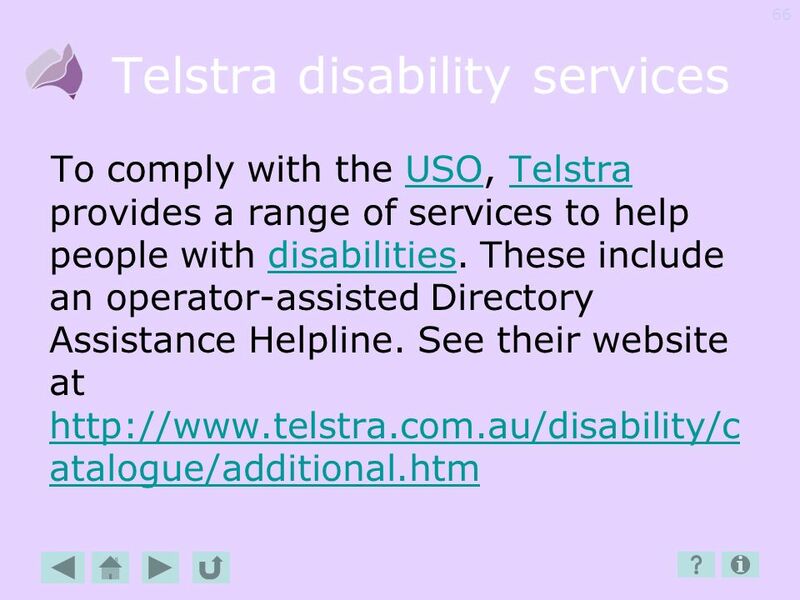 It is also available to anyone who wants to call someone with a hearing or speech impairment (via TTY). 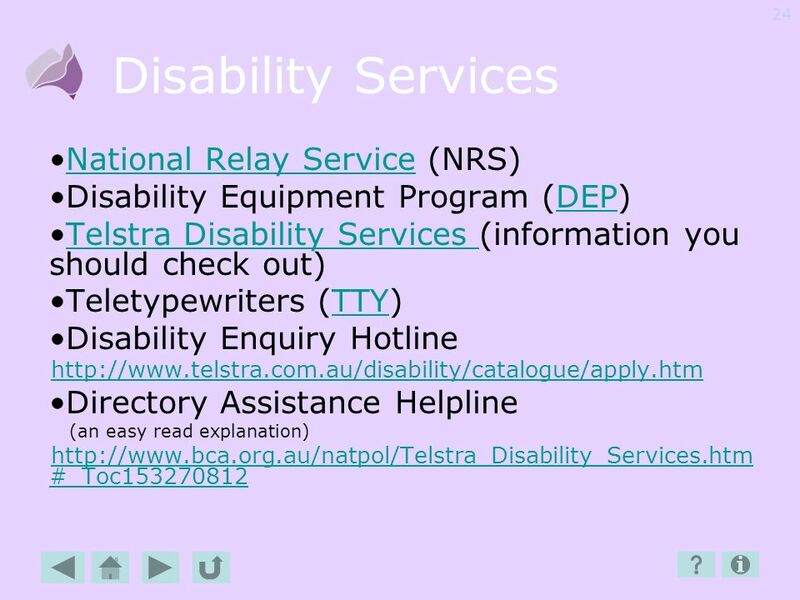 The NRS website is: There are other disability services available. 43 Network A network is a way of linking phones, computers and other devices together. See also: Bluetooth, Ethernet, Internet, LAN, Mobile Network, WAN. 44 NextG® Telstra’s 3G mobile network. 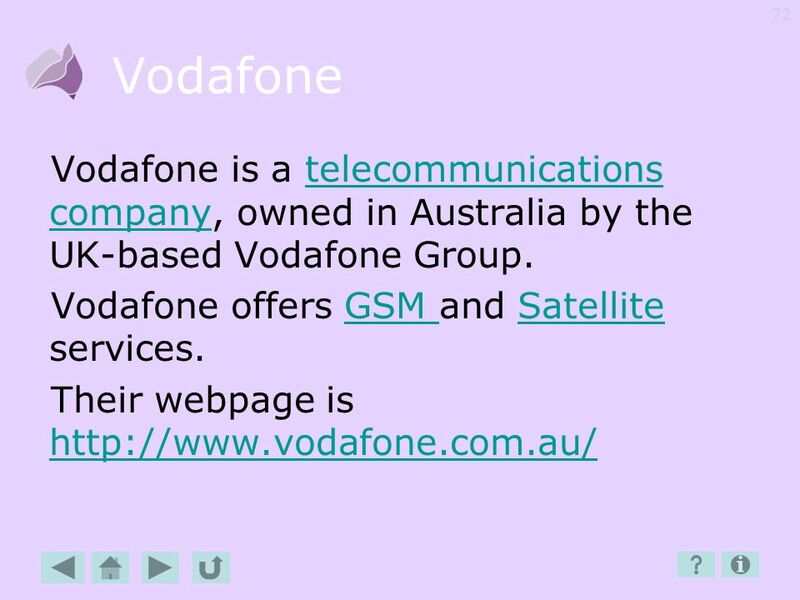 It is the largest mobile network in Australia. Telstra’s CDMA customers were encouraged to move to NextG® when the Telstra CDMA network closed on 28 April 2008. 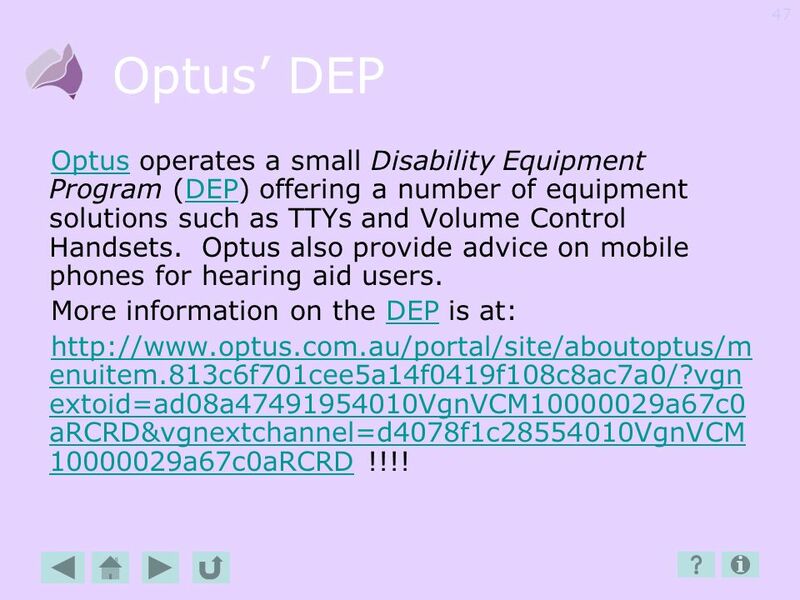 47 Optus’ DEP Optus operates a small Disability Equipment Program (DEP) offering a number of equipment solutions such as TTYs and Volume Control Handsets. Optus also provide advice on mobile phones for hearing aid users. More information on the DEP is at: !!!! 48 Overseas There are world standards which govern how phone networks in different countries can talk to each other. 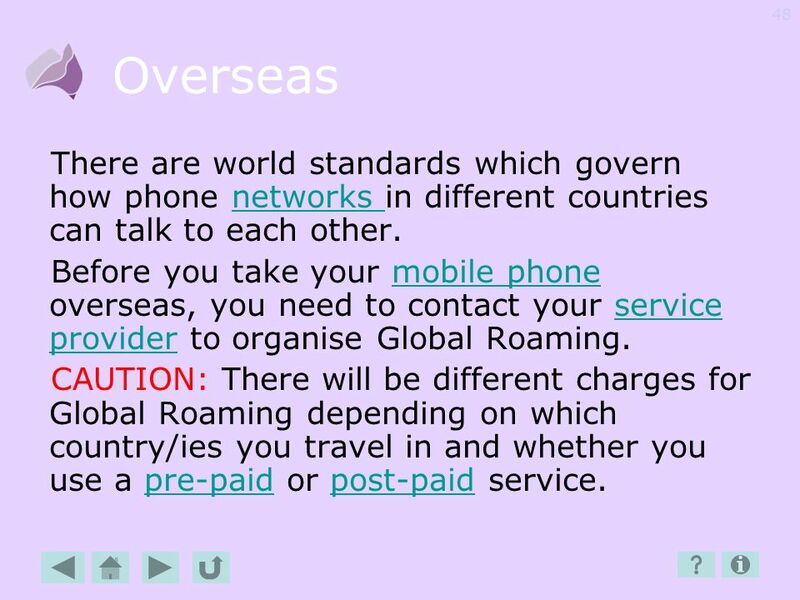 Before you take your mobile phone overseas, you need to contact your service provider to organise Global Roaming. CAUTION: There will be different charges for Global Roaming depending on which country/ies you travel in and whether you use a pre-paid or post-paid service. 49 Palmtop A palmtop is a computer that is small enough to fit in your pocket. They are also called ‘organisers’. Usually they don’t use the Windows program commonly used by computers. Often, these devices will double as a mobile phone, or at least talk to your mobile phone using WiFi or Bluetooth. 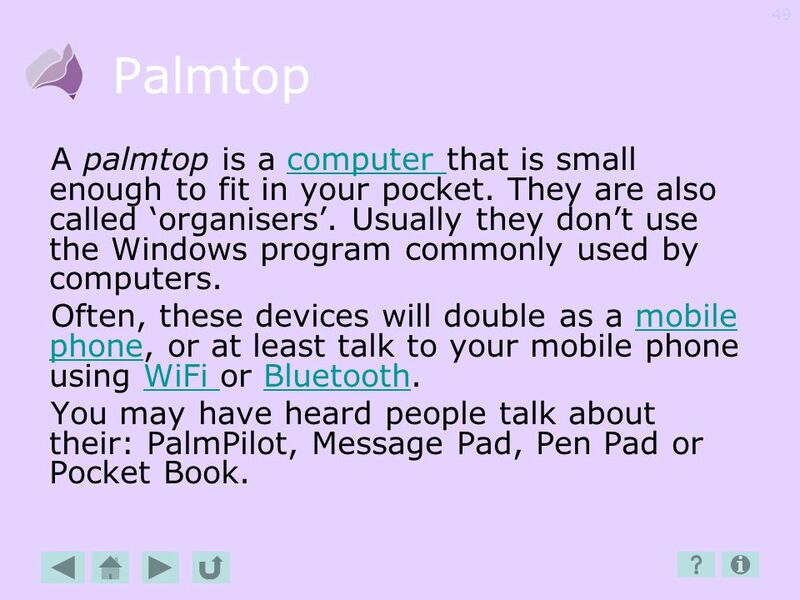 You may have heard people talk about their: PalmPilot, Message Pad, Pen Pad or Pocket Book. 50 Phone Once a black box with a handpiece and a dial, phones are now push-button devices with which you can talk, message, send photos, watch television, surf the Internet and just about anything else. This is called progress. 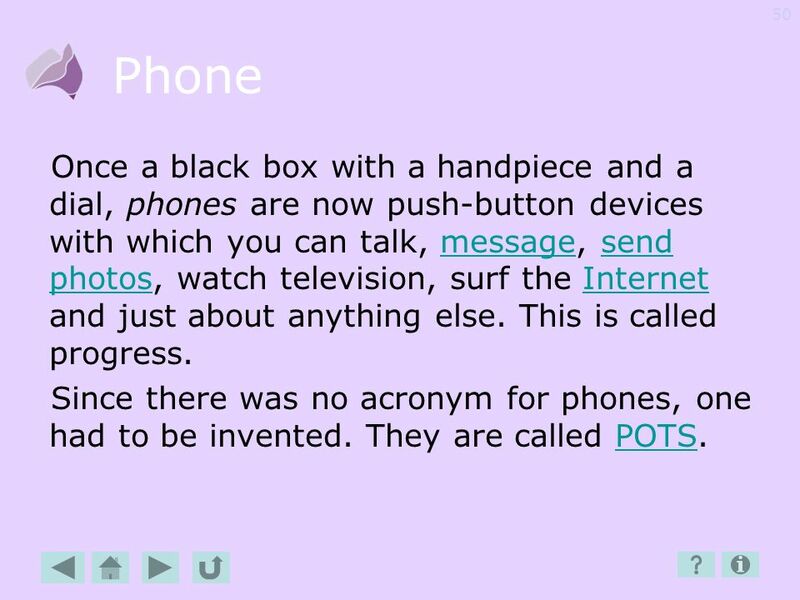 Since there was no acronym for phones, one had to be invented. They are called POTS. 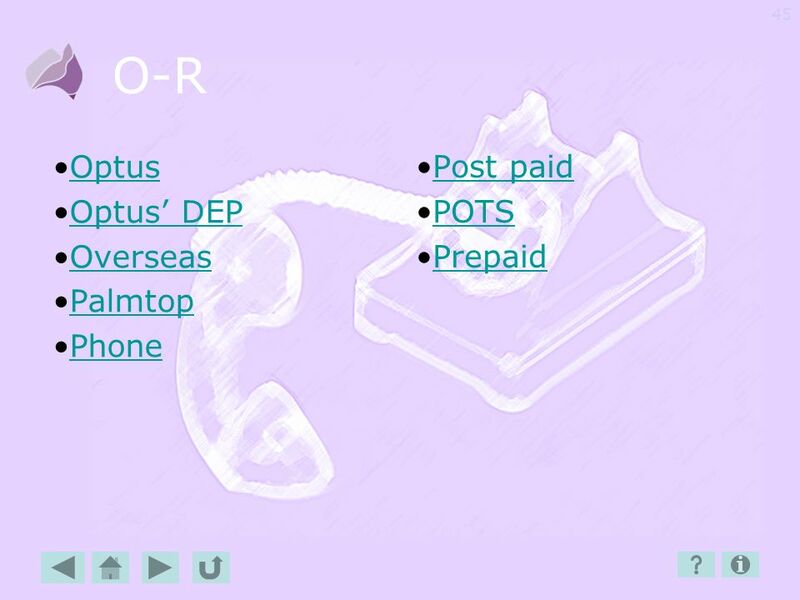 51 Post-paid Post-paid is one way to pay for your mobile phone service. 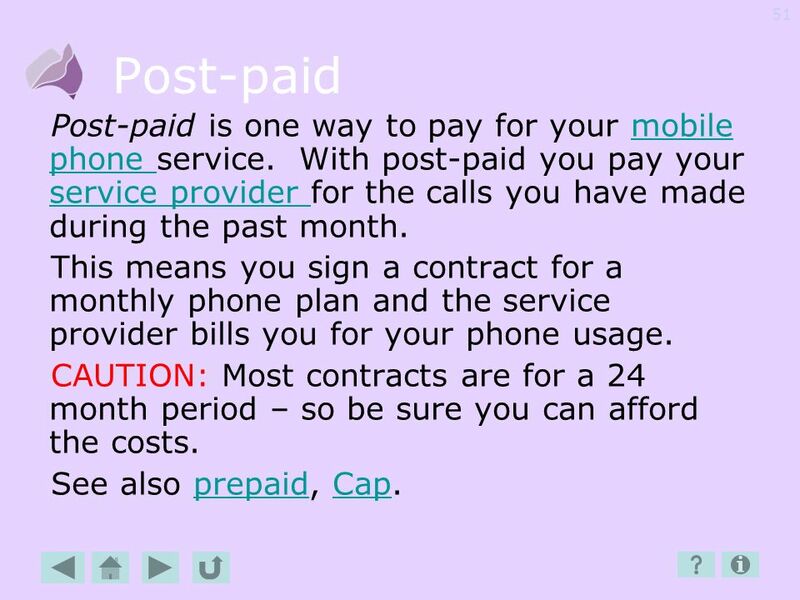 With post-paid you pay your service provider for the calls you have made during the past month. This means you sign a contract for a monthly phone plan and the service provider bills you for your phone usage. CAUTION: Most contracts are for a 24 month period – so be sure you can afford the costs. See also prepaid, Cap. 52 POTS POTS stands for Plain Old Telephone Services. A regular home telephone. Most modern home phones have features such as Call waiting, Caller ID, Conference calls and Speed dialling. Many households use a cordless phone to have the freedom to take calls anywhere round the home. 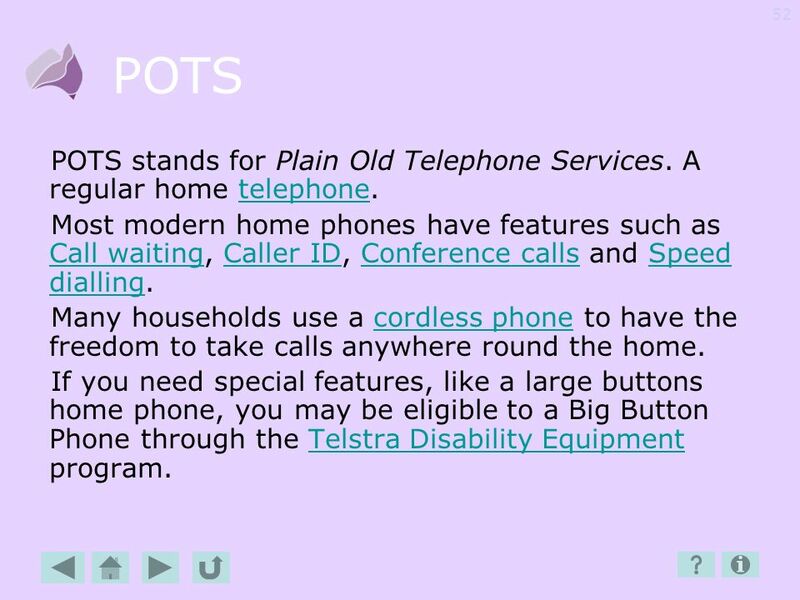 If you need special features, like a large buttons home phone, you may be eligible to a Big Button Phone through the Telstra Disability Equipment program. 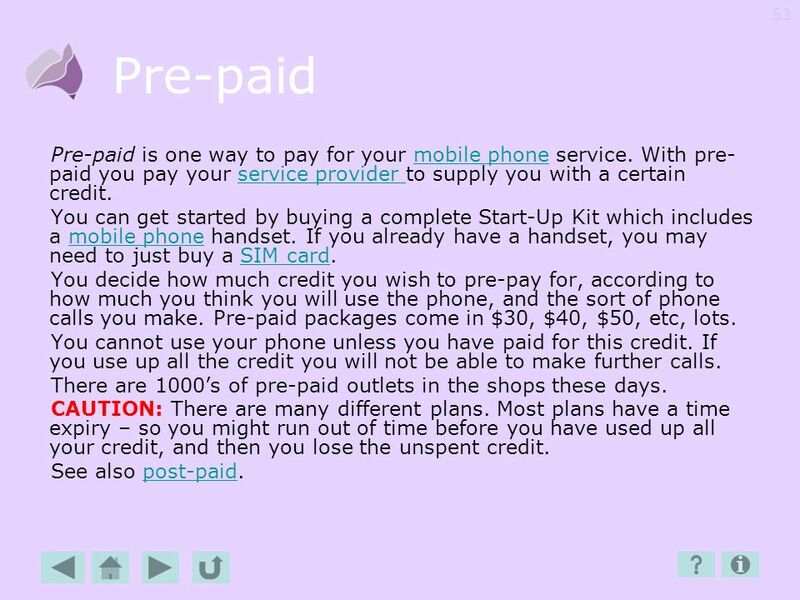 53 Pre-paid Pre-paid is one way to pay for your mobile phone service. With pre-paid you pay your service provider to supply you with a certain credit. You can get started by buying a complete Start-Up Kit which includes a mobile phone handset. If you already have a handset, you may need to just buy a SIM card. You decide how much credit you wish to pre-pay for, according to how much you think you will use the phone, and the sort of phone calls you make. Pre-paid packages come in $30, $40, $50, etc, lots. You cannot use your phone unless you have paid for this credit. If you use up all the credit you will not be able to make further calls. There are 1000’s of pre-paid outlets in the shops these days. CAUTION: There are many different plans. Most plans have a time expiry – so you might run out of time before you have used up all your credit, and then you lose the unspent credit. See also post-paid. 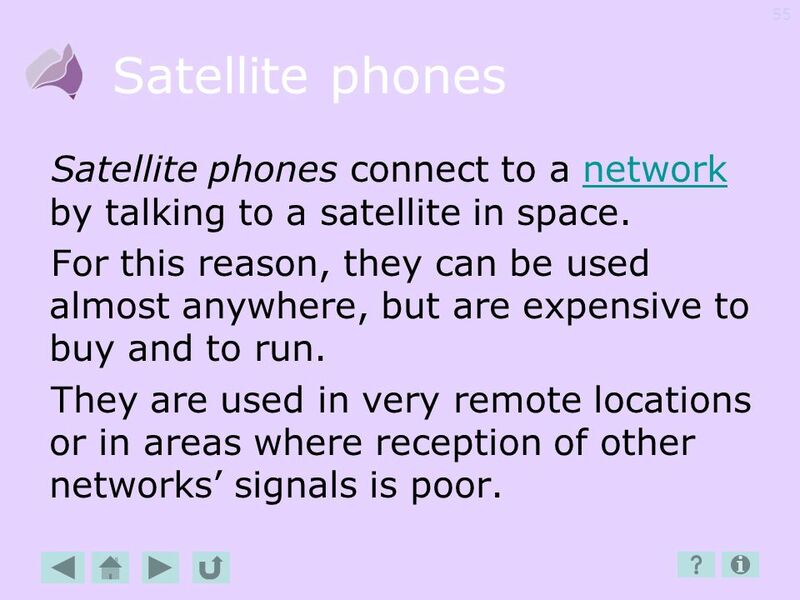 55 Satellite phones Satellite phones connect to a network by talking to a satellite in space. For this reason, they can be used almost anywhere, but are expensive to buy and to run. They are used in very remote locations or in areas where reception of other networks’ signals is poor. 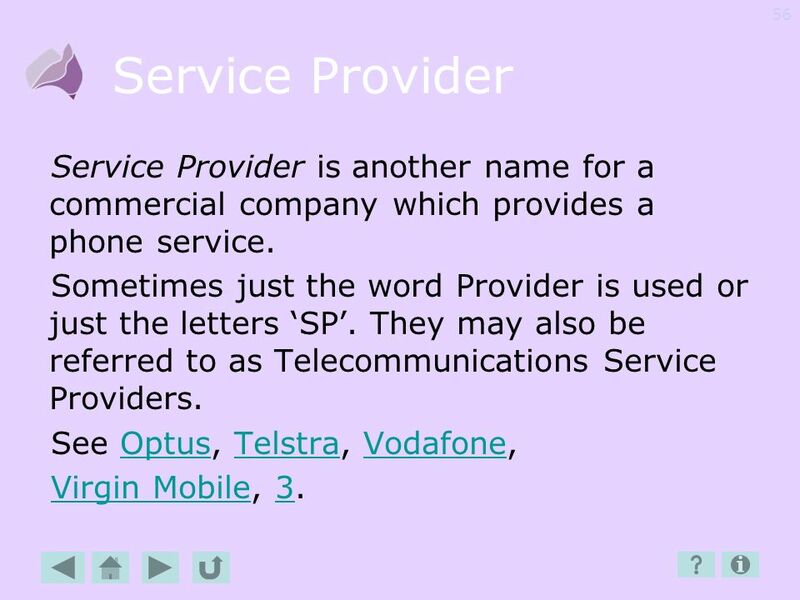 56 Service Provider Service Provider is another name for a commercial company which provides a phone service. Sometimes just the word Provider is used or just the letters ‘SP’. They may also be referred to as Telecommunications Service Providers. 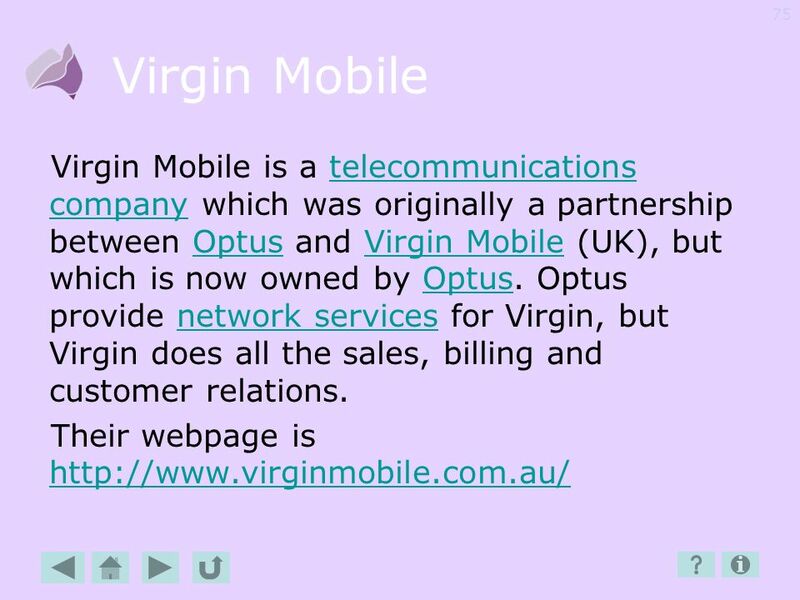 See Optus, Telstra, Vodafone, Virgin Mobile, 3. 57 SIM card A SIM card is a little card that fits in the back of your mobile phone to tell the mobile network who you are. Your SIM card may also hold your personal information, such as addresses and phone numbers you use, or a calendar, or reminders. If you change your phone number you will probably have to change your SIM card. Mobile number portability means that if you change the mobile network you use you can keep the same phone number, but you may have to get a new SIM card. If you just change phones, all you need do is move your SIM card to the new phone. 59 SMS SMS stands for Short Message Service. It is also known as Texting. These days, nearly all mobile phones allow you to send SMS. You type a message on your mobile phone keypad, and send it to another phone. 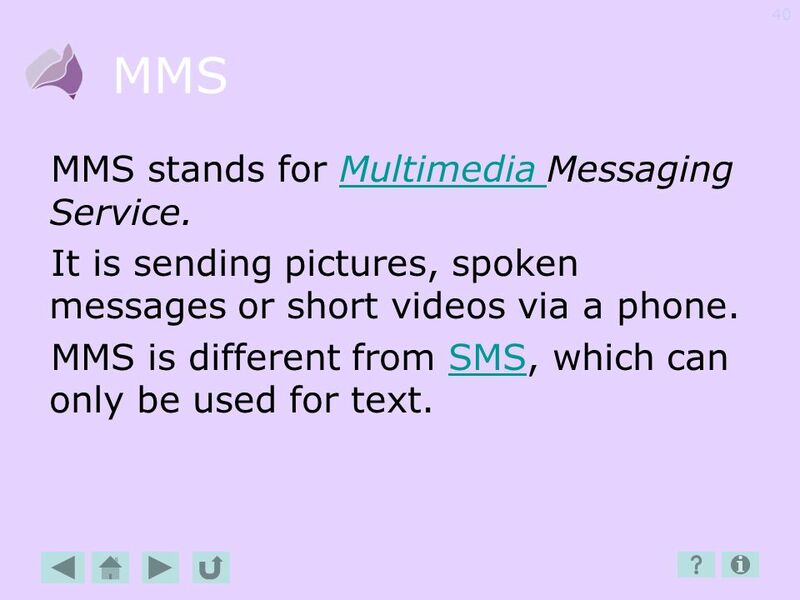 A newer system, called MMS, allows you to send Multimedia messages. 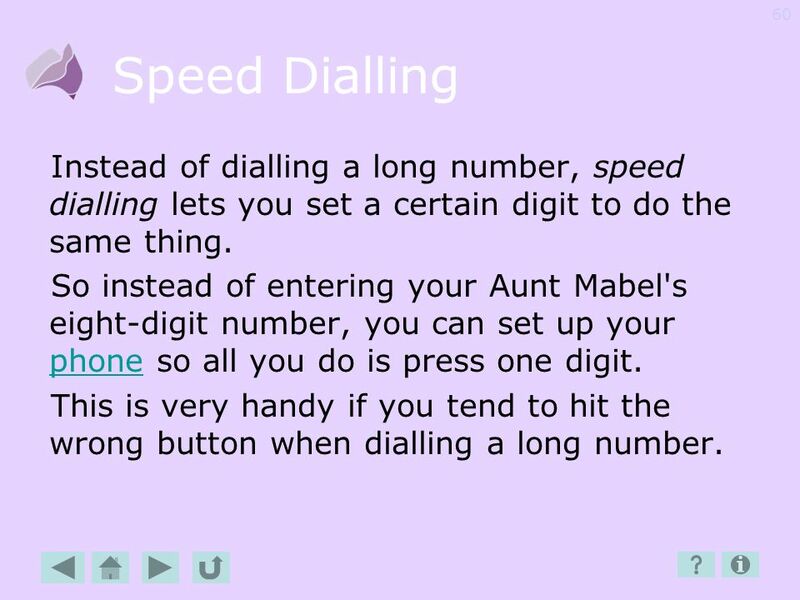 60 Speed Dialling Instead of dialling a long number, speed dialling lets you set a certain digit to do the same thing. So instead of entering your Aunt Mabel's eight-digit number, you can set up your phone so all you do is press one digit. This is very handy if you tend to hit the wrong button when dialling a long number. 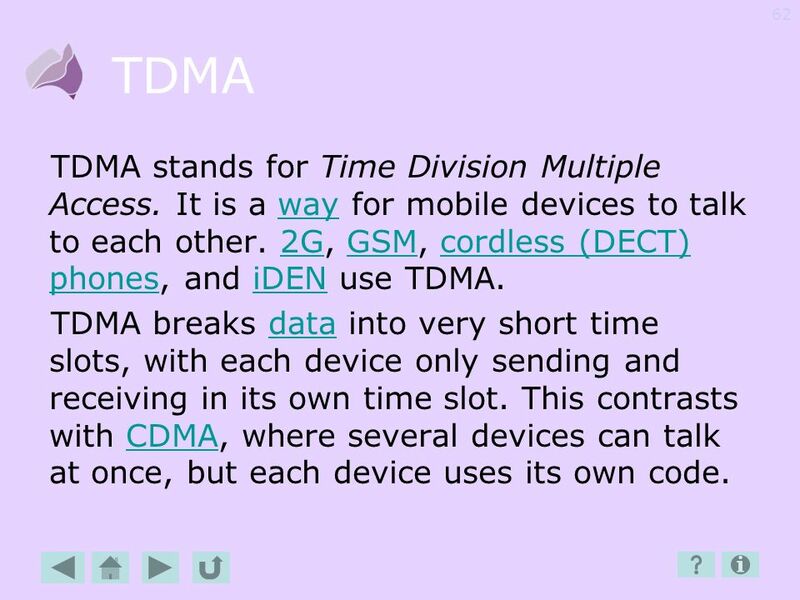 62 TDMA TDMA stands for Time Division Multiple Access. It is a way for mobile devices to talk to each other. 2G, GSM, cordless (DECT) phones, and iDEN use TDMA. TDMA breaks data into very short time slots, with each device only sending and receiving in its own time slot. 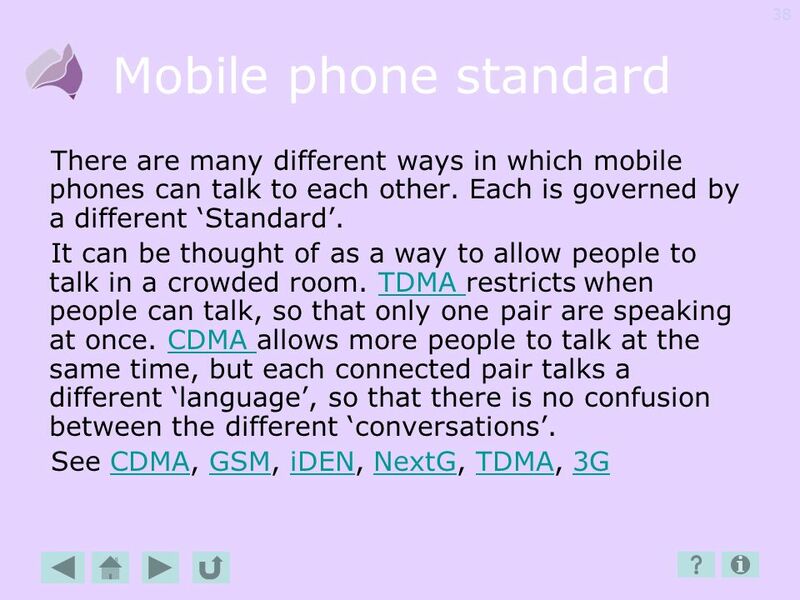 This contrasts with CDMA, where several devices can talk at once, but each device uses its own code. 64 Telstra’s DEP Telstra runs a major Disability Equipment Program (DEP). Telstra's DEP has been designed to provide eligible customers with specialised equipment to access the standard telephone service. 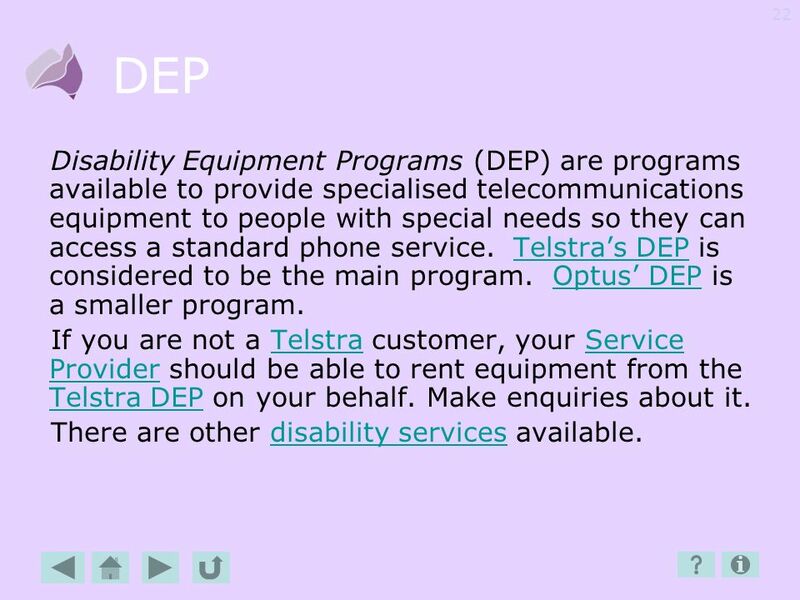 Equipment may be viewed online OR enquire at a Telstra Shopfront and ask for a copy of their Disability Equipment Program catalogue. 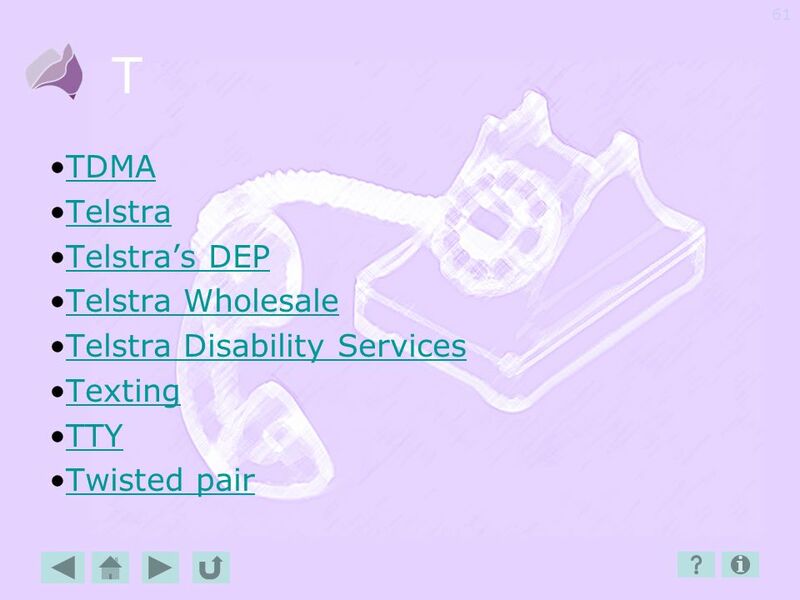 More information is at: Telstra also provides additional services for people with disabilities. 67 Texting Texting is a noun that has become a verb. To ‘text’ someone is to send short messages between mobile phones, using SMS. 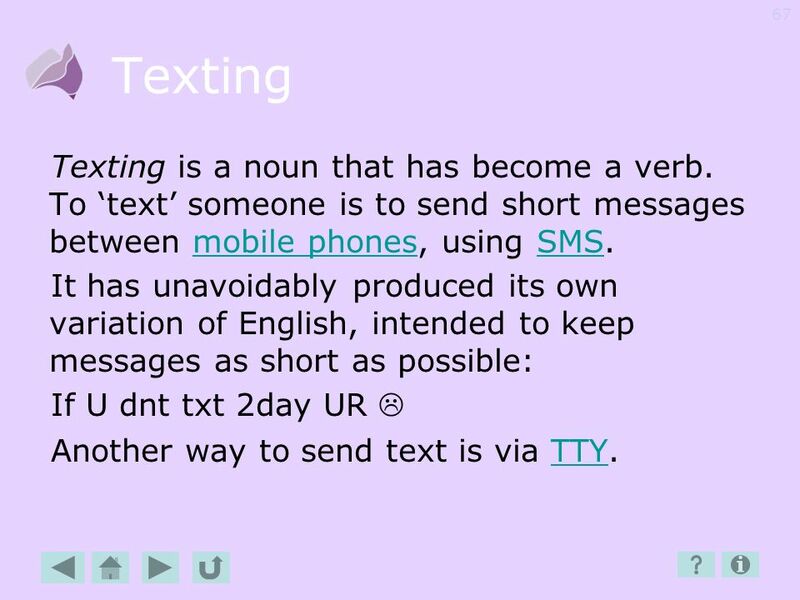 It has unavoidably produced its own variation of English, intended to keep messages as short as possible: If U dnt txt 2day UR  Another way to send text is via TTY. 68 TTY Teletypewriters (TTYs) allow you to send and receive text messages over a telephone. 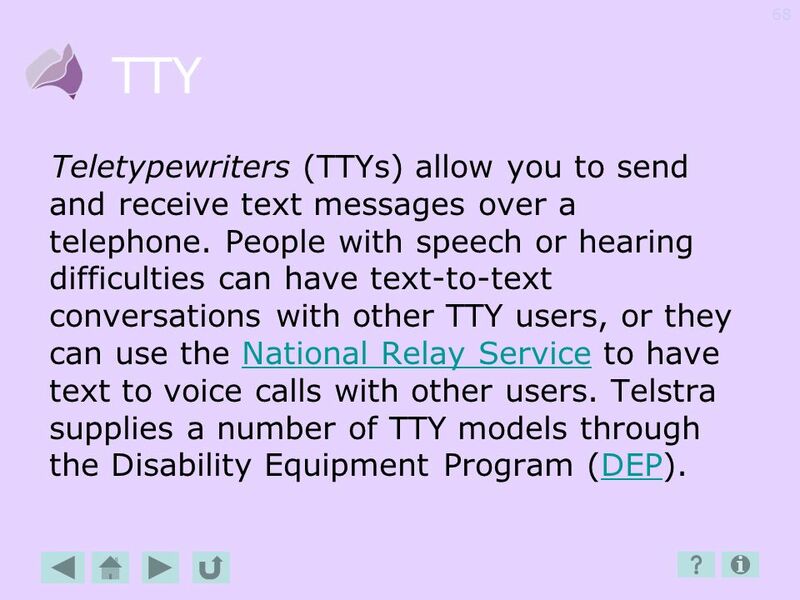 People with speech or hearing difficulties can have text-to-text conversations with other TTY users, or they can use the National Relay Service to have text to voice calls with other users. 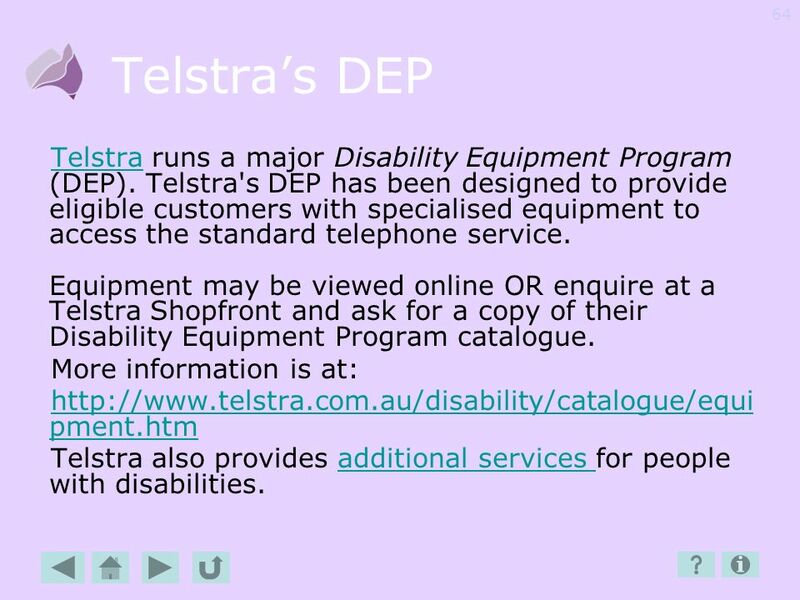 Telstra supplies a number of TTY models through the Disability Equipment Program (DEP). 69 Twisted pair Somewhat disappointingly, this just means two wires twisted together. 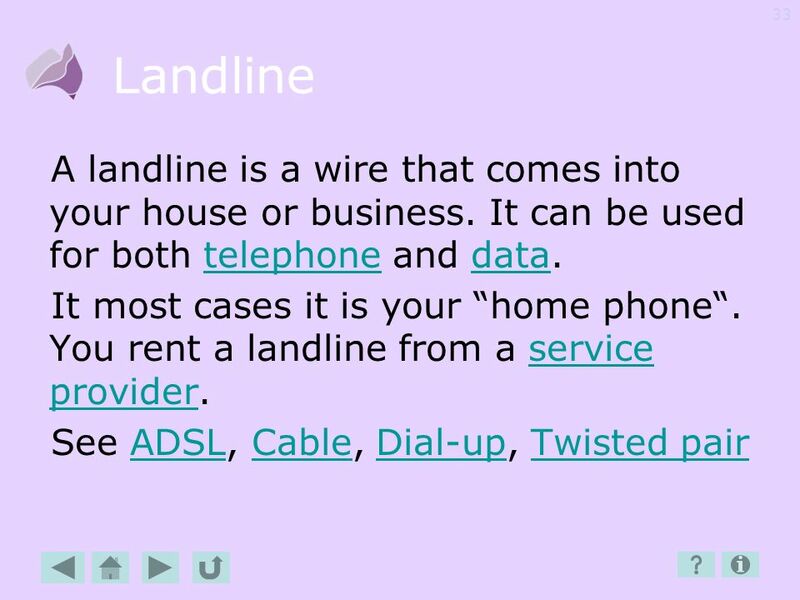 It is one form of landline. 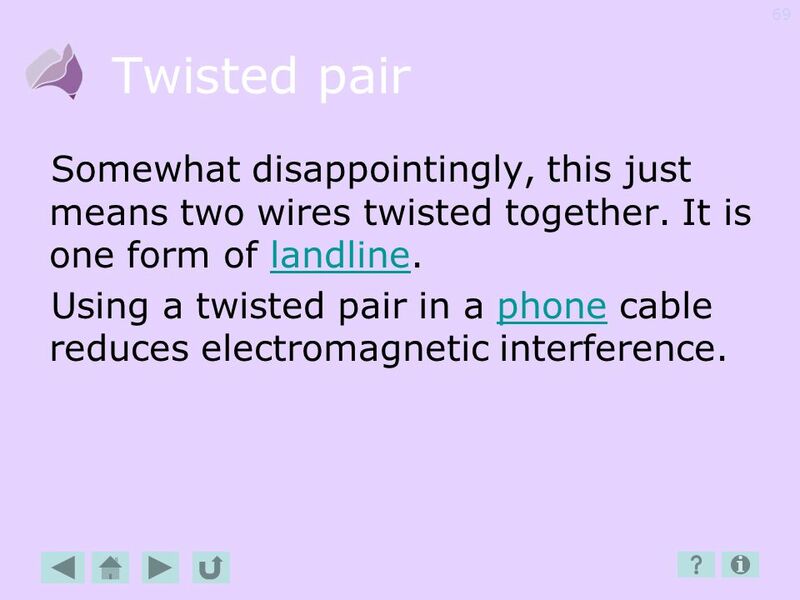 Using a twisted pair in a phone cable reduces electromagnetic interference. 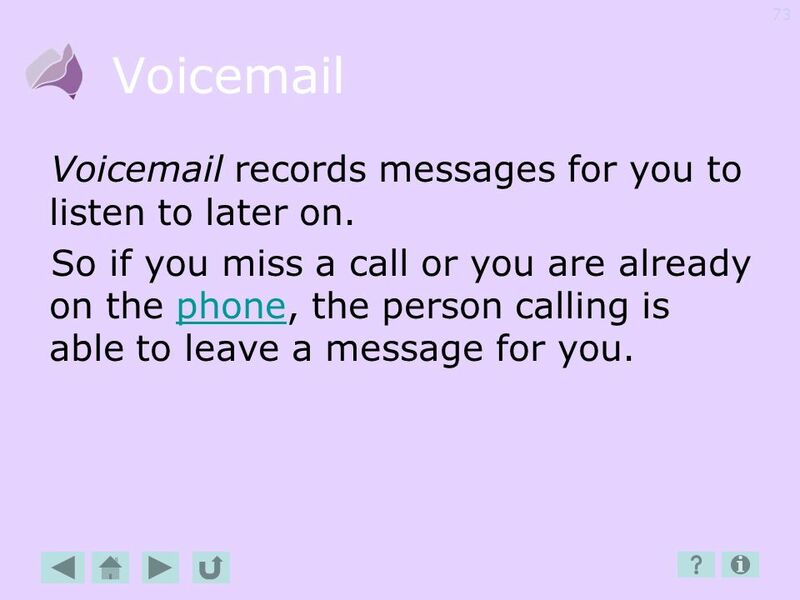 73 Voicemail Voicemail records messages for you to listen to later on. So if you miss a call or you are already on the phone, the person calling is able to leave a message for you. 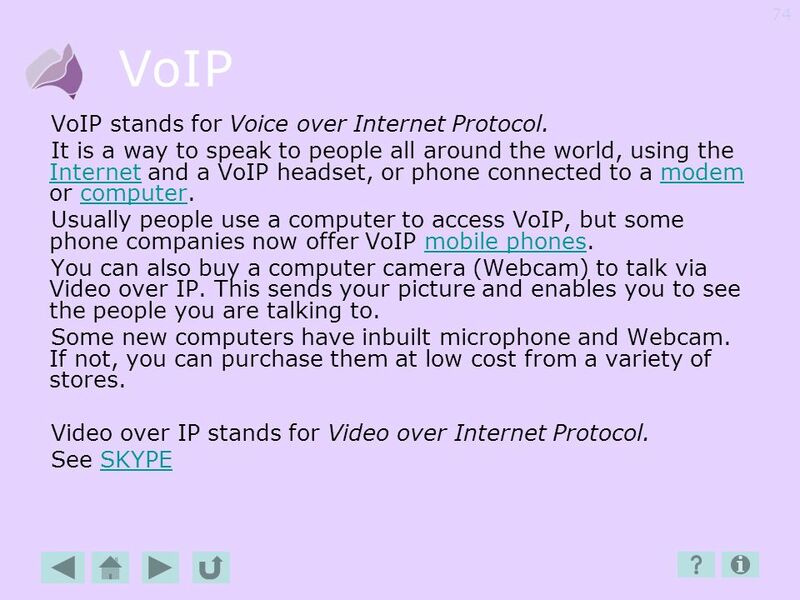 74 VoIP VoIP stands for Voice over Internet Protocol. 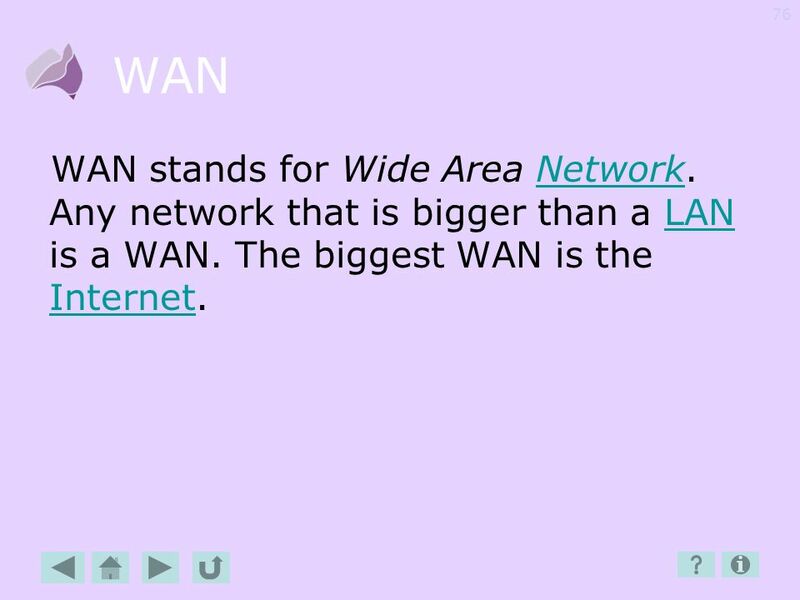 76 WAN WAN stands for Wide Area Network. Any network that is bigger than a LAN is a WAN. The biggest WAN is the Internet. 77 WiFi WiFi stands for Wireless Fidelity. It is one type of Wireless Networking. 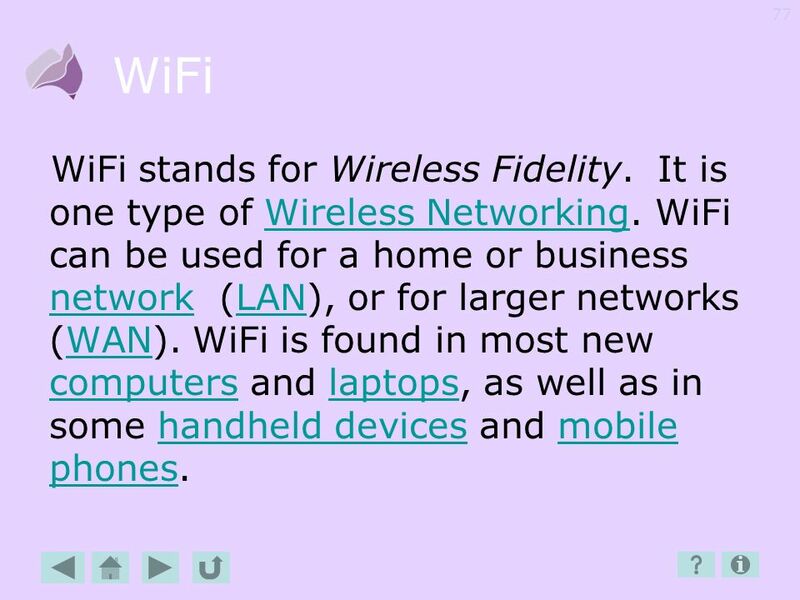 WiFi can be used for a home or business network (LAN), or for larger networks (WAN). 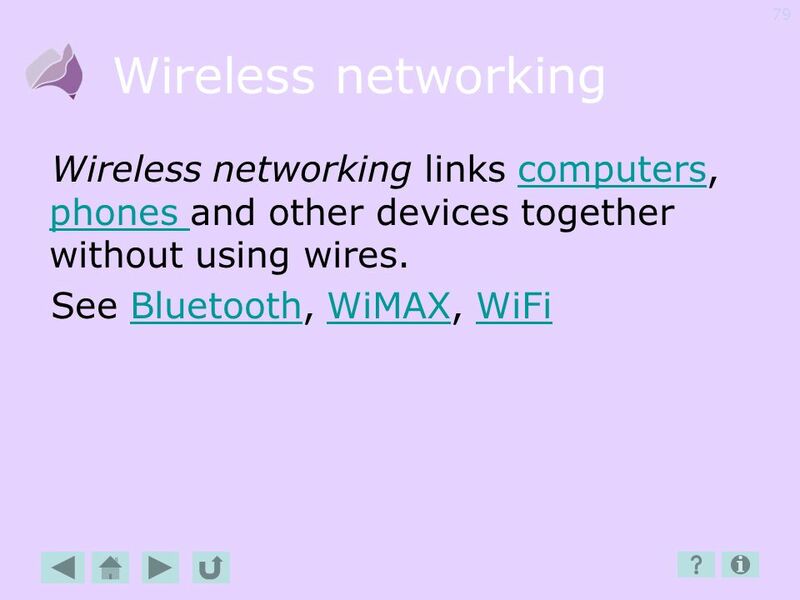 WiFi is found in most new computers and laptops, as well as in some handheld devices and mobile phones. 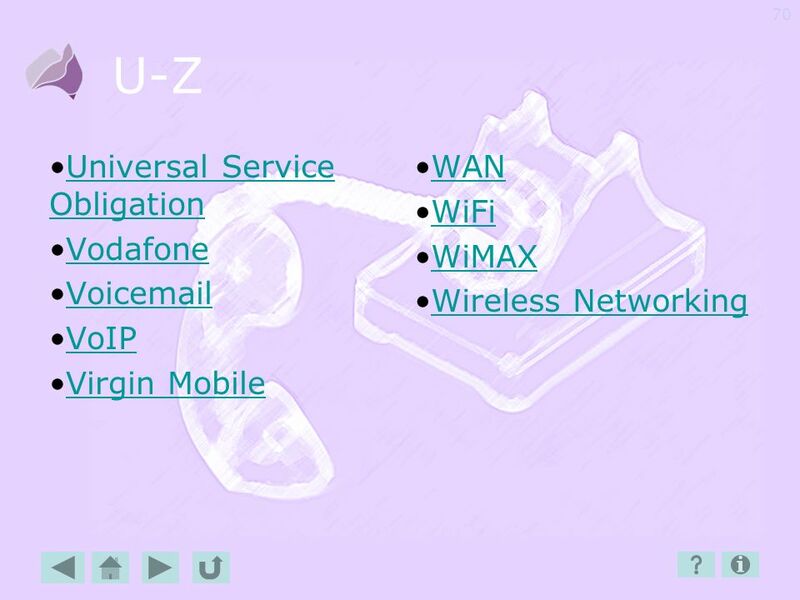 78 WiMAX WiMAX stands for Worldwide Interoperability for Microwave Access. It is a type of wireless networking to provide broadband communication, that works over larger distances than WiFi. 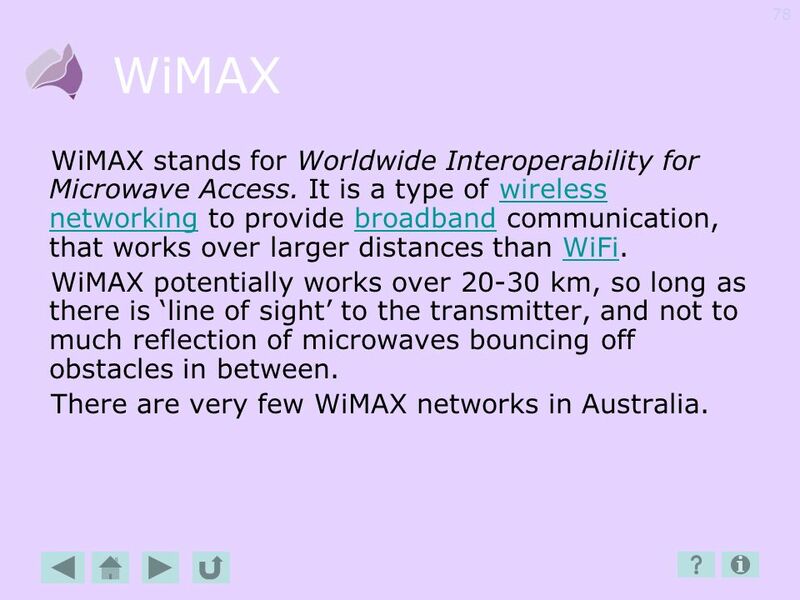 WiMAX potentially works over km, so long as there is ‘line of sight’ to the transmitter, and not to much reflection of microwaves bouncing off obstacles in between. There are very few WiMAX networks in Australia. 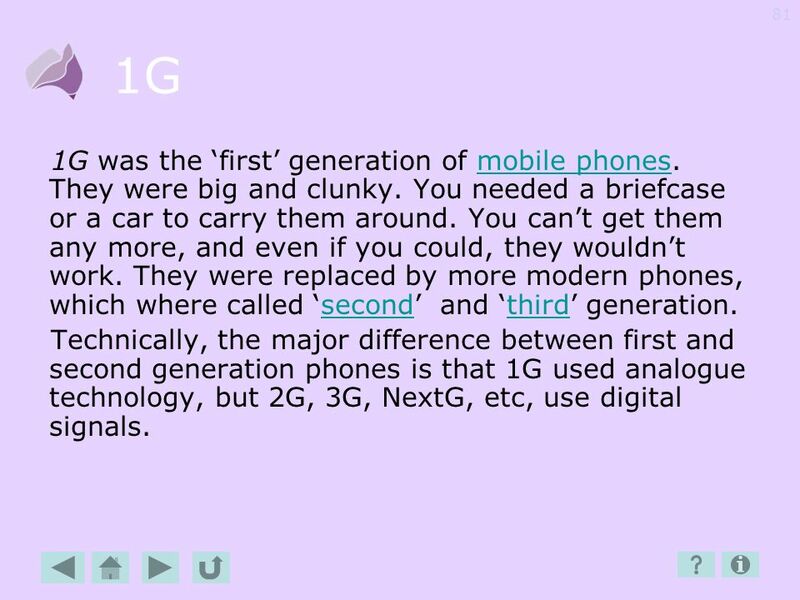 81 1G 1G was the ‘first’ generation of mobile phones. They were big and clunky. You needed a briefcase or a car to carry them around. You can’t get them any more, and even if you could, they wouldn’t work. They were replaced by more modern phones, which where called ‘second’ and ‘third’ generation. 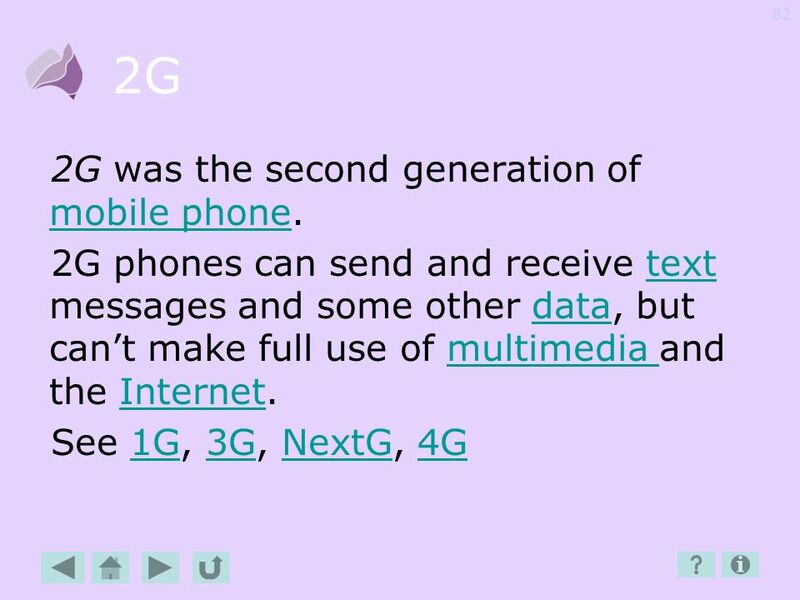 Technically, the major difference between first and second generation phones is that 1G used analogue technology, but 2G, 3G, NextG, etc, use digital signals. 82 2G 2G was the second generation of mobile phone. 83 3G 3G is the third generation of mobile phone. 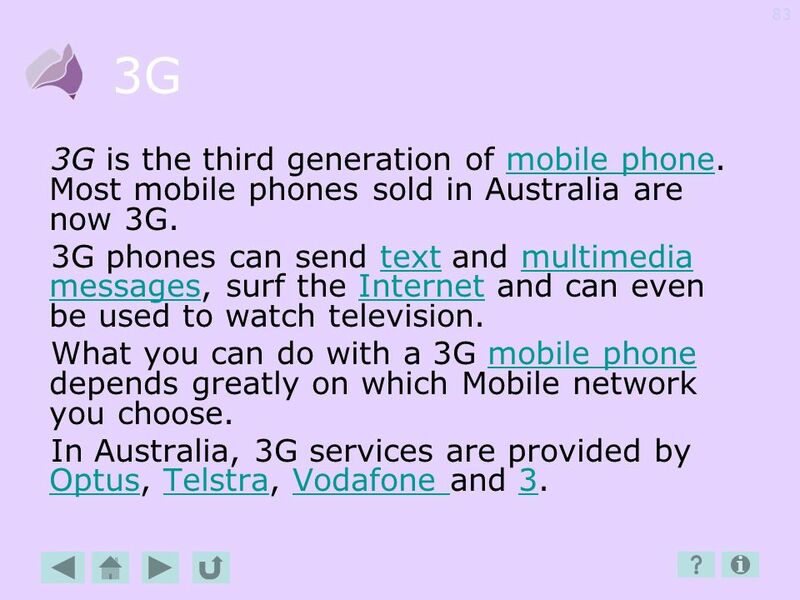 Most mobile phones sold in Australia are now 3G. 3G phones can send text and multimedia messages, surf the Internet and can even be used to watch television. What you can do with a 3G mobile phone depends greatly on which Mobile network you choose. 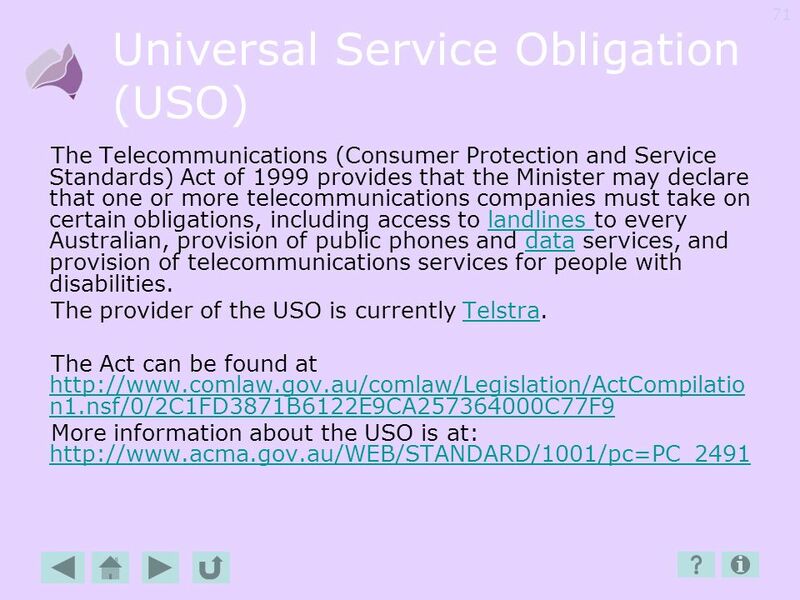 In Australia, 3G services are provided by Optus, Telstra, Vodafone and 3. 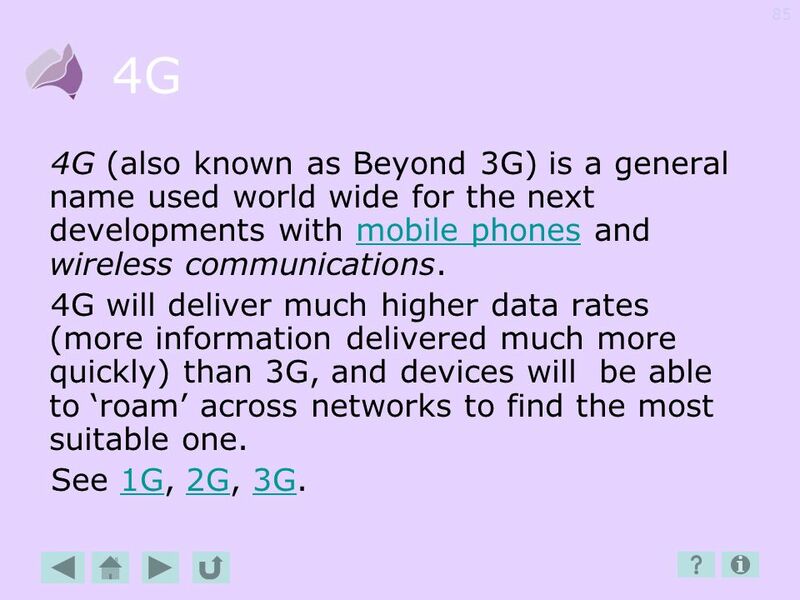 85 4G 4G (also known as Beyond 3G) is a general name used world wide for the next developments with mobile phones and wireless communications. 4G will deliver much higher data rates (more information delivered much more quickly) than 3G, and devices will be able to ‘roam’ across networks to find the most suitable one. See 1G, 2G, 3G. 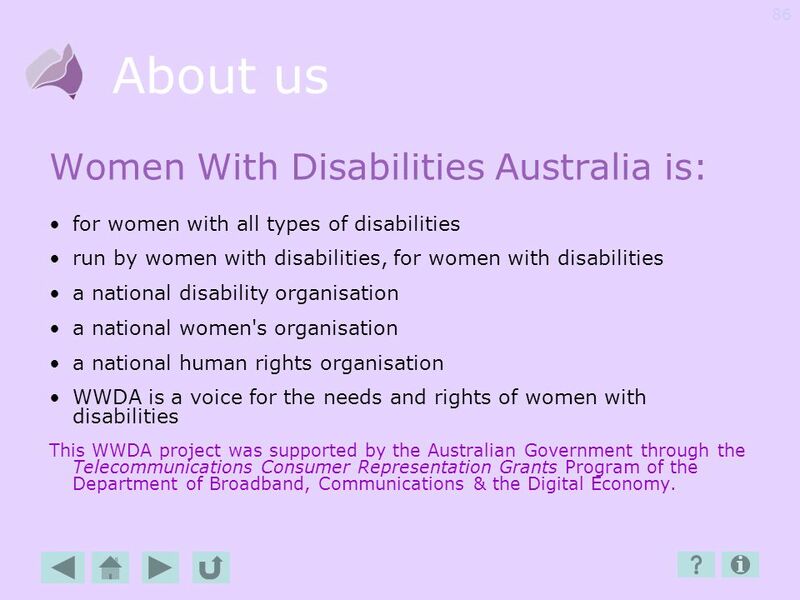 for women with all types of disabilities run by women with disabilities, for women with disabilities a national disability organisation a national women's organisation a national human rights organisation WWDA is a voice for the needs and rights of women with disabilities This WWDA project was supported by the Australian Government through the Telecommunications Consumer Representation Grants Program of the Department of Broadband, Communications & the Digital Economy. Download ppt "A short dictionary of mobile communication in Australia"
How to Be an Inventor Week 1 Instructor: Drew Boyd 1. Name of presenter(s) or subtitle Canadian Netizens February 2004.